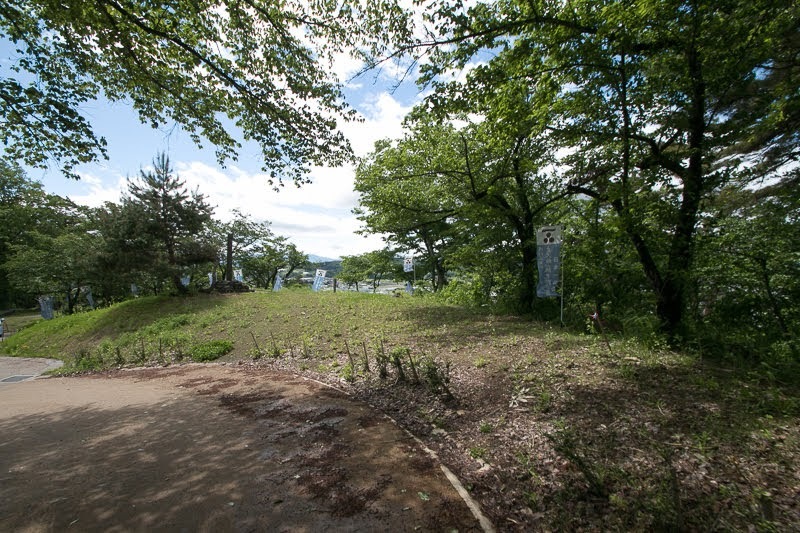 Aterazawa Tateyama castle (左沢楯山城) spreads over a plateau of 100 meter height faces U letter shaped curving point of Mogami-gawa river, at the east of former town center of Aterazawa town. 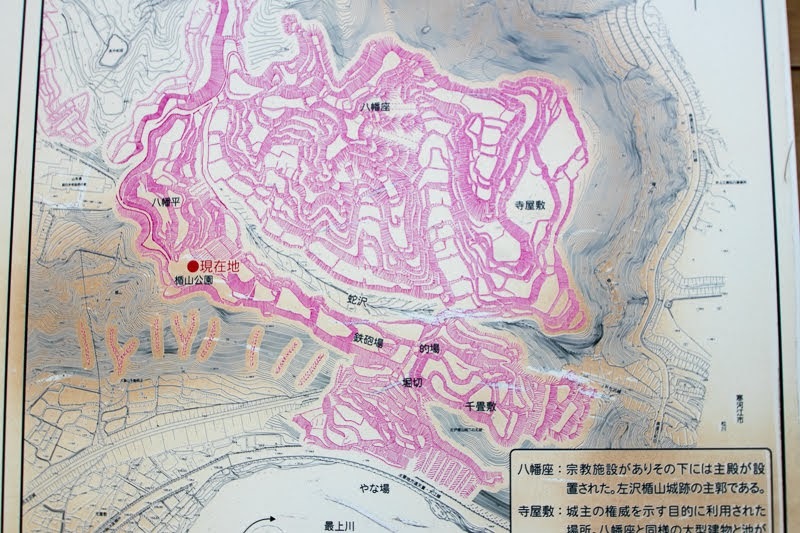 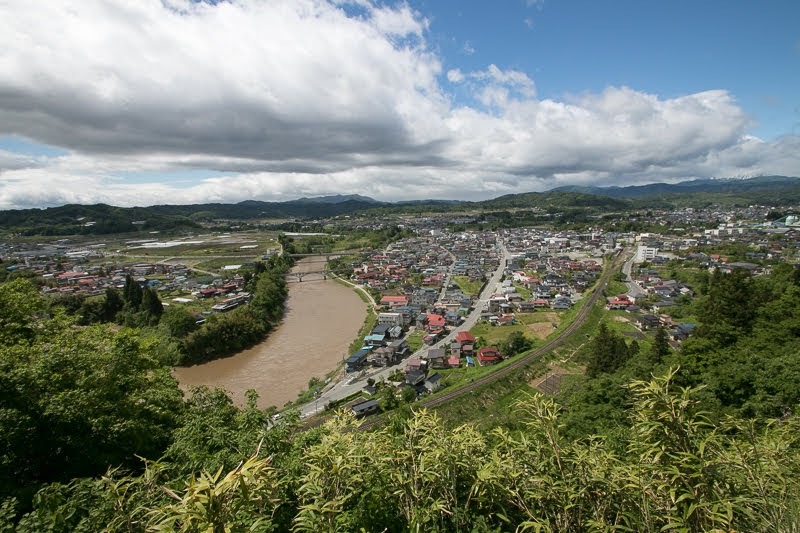 Aterazawa area is located at the left line of middle part of Yamagata basin, and an important point where Mogami-gawa river and its tributary Sagae-gawa river flows into Yamagata basin. Aterazawa area is a critical point to control river transportation of Mogami-gawa river, both for micro and macro perspective. 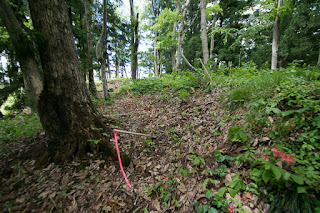 From micro perspective, a higher place which faces curving point of river was an ideal point to control ships. 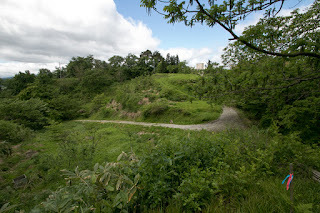 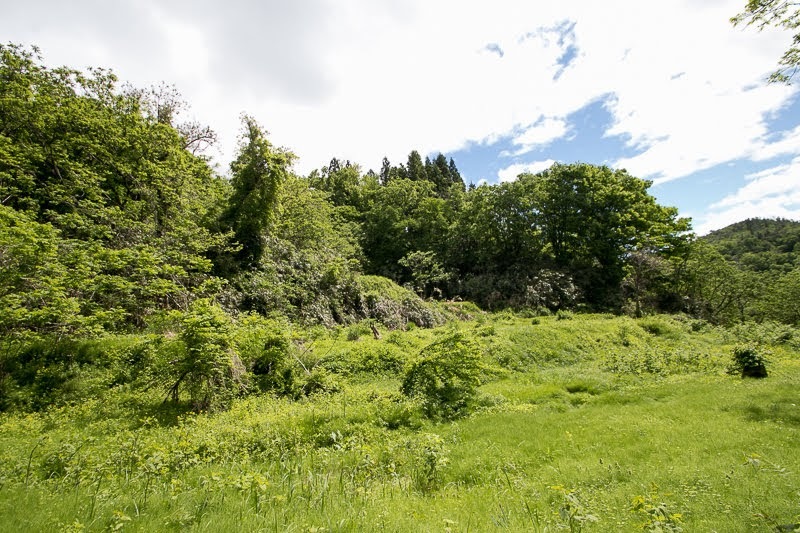 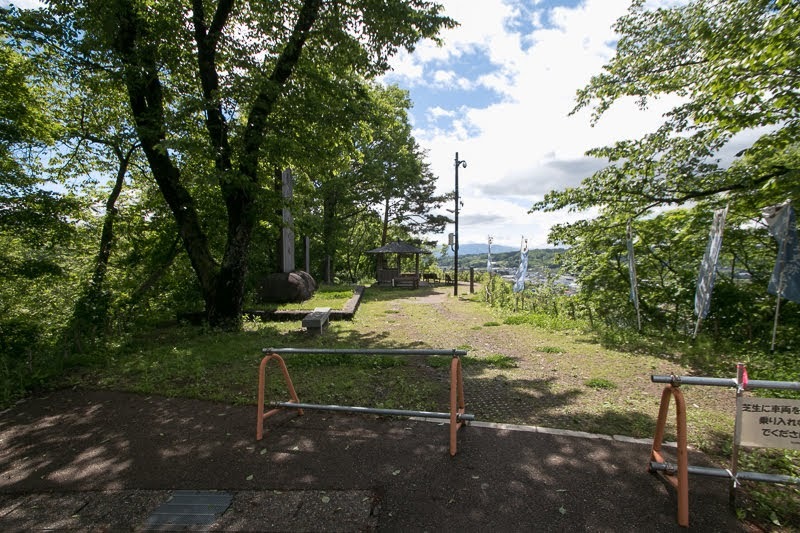 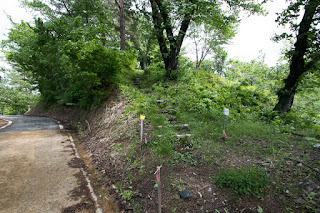 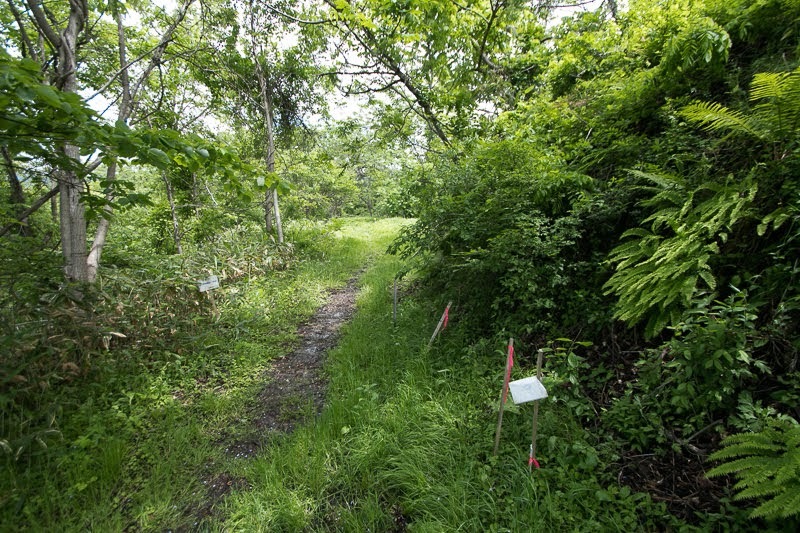 On the other hand, from macro perspective, as Aterazawa area was the most inland area where ships could sail at medieval era, this area was an important connecting point of land transportation at upstream of the river and river transportation. 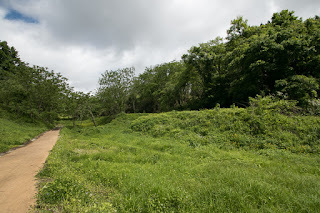 Mogami-gawa river was one of the rivers where river transportation prospered before modern era. 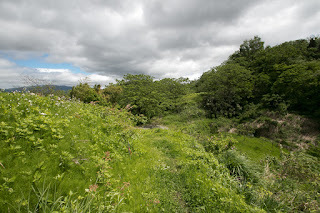 This river connects Yonezawa basin, Yamagata basin and Sakata plain where were major rice cultivation area, and had been used for the loading route of rice toward central area along with coast side line of the Sea of Japan. 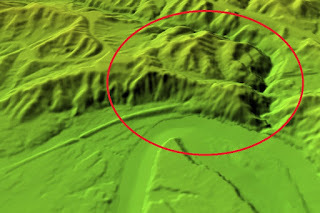 As these three areas are surrounded by mountains, only river transportation could transport commodities of the area. 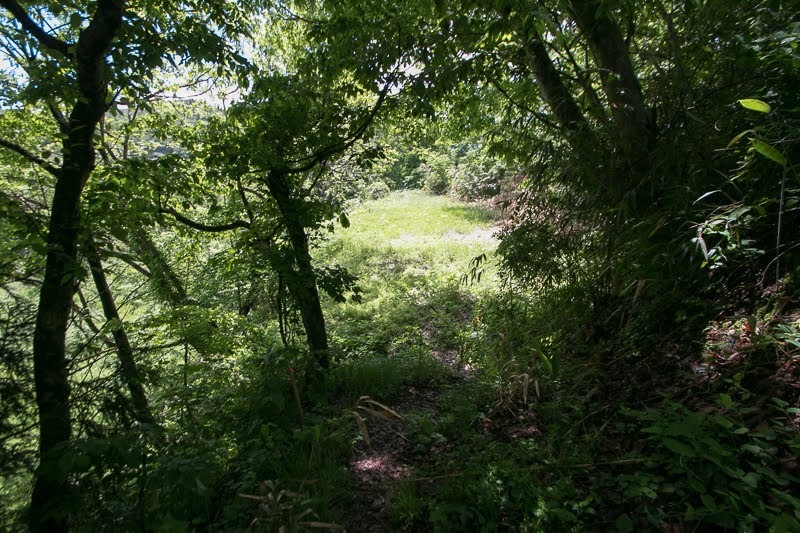 Mogami-gawa river was a tough river with swift current, but abundant water from Gassan mountains enabled the sail of middle-size ships to the middle part of the river. 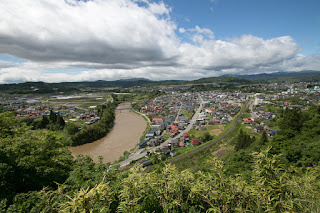 In response to the loading of the rice, items of other areas such as fishes, teas, furs, metal items or ceramics are brought to the province with the river, along with the culture of the central area. 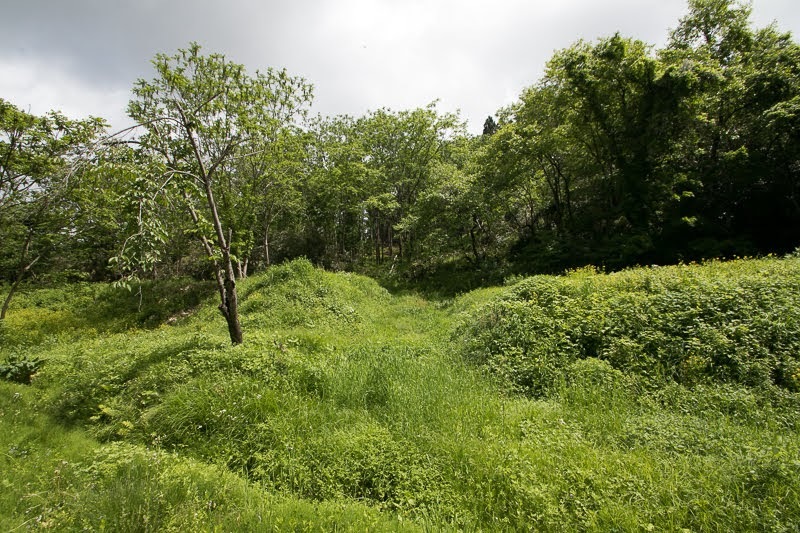 Ancient dynasty placed river terminals along the river, and communication with central area made record of the river by central nobles. Mogami-gawa river was exactly artery of Dewa province (Yamagata prefecture) before the arrival of railroads, cars and planes. 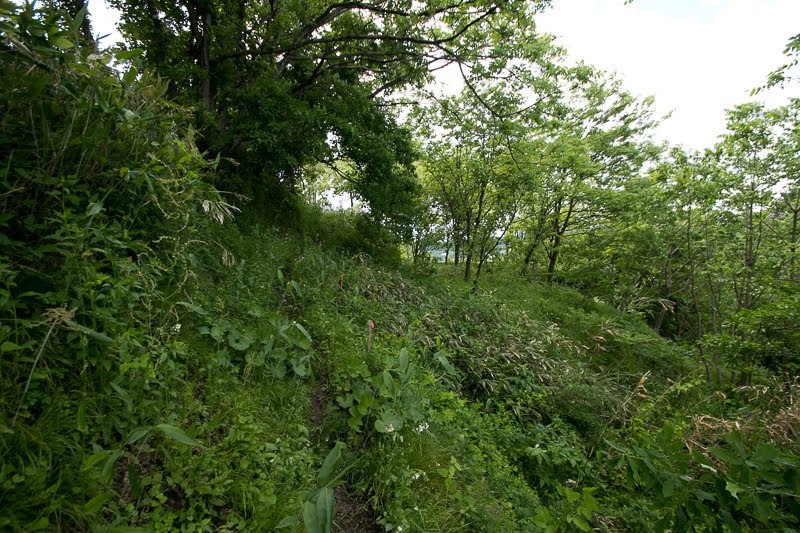 Aterazawa-Tateyama castle was built by local lord Aterazawa clan in 14th century. 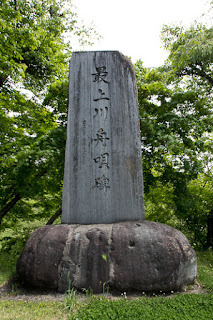 Aterazawa clan was a descendant of Hiromoto Oe (1148-1225), a noble and bureaucrat under Yoritomo Minamoto (1147-1199), the founder of Kamakura Shogunate. 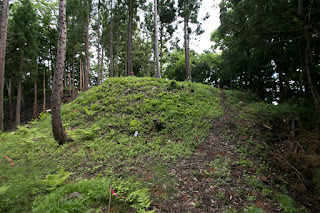 Because of their contribution Oe clan achieved manors at various place, and placed their branch families to these manors. 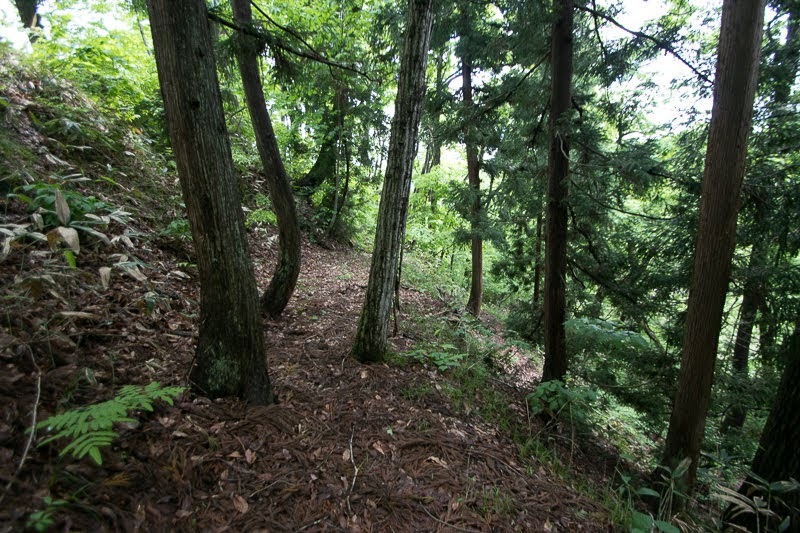 Although main family of Oe clan fell after various conflicts, but branch families became the origin of major local lords such as Hojo clan at Echigo province (Niigata prefecture) or Mori clan of Aki province (Hiroshima prefecture). 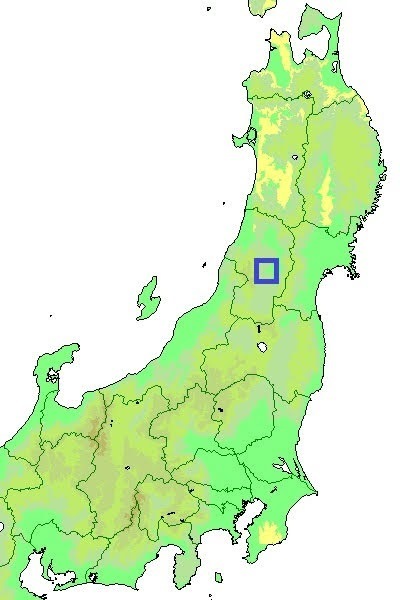 At Dewa province, Oe clan held upstream of Mogami-gawa river from Sagae area to Nagai area, then grew as Nagai clan, Sagae clan or Aterazawa clan utilizing the name of their territory as surname. After the fall of Kamakura Shogunate, different from Hojo clan or Mori clan, descendant of Oe clan at Dewa province experienced tough history. 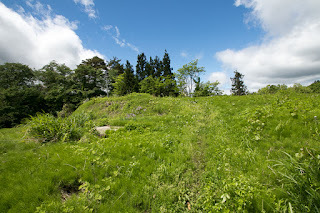 Among the conflict between Muromachi Shogunate and the South Court, they supported the latter but Muromachi Shogunate sent their relative Shiba clan to subjugate them. In 1368, Sagae clan raised their army along with Aterazwa clan against Shiba clan. 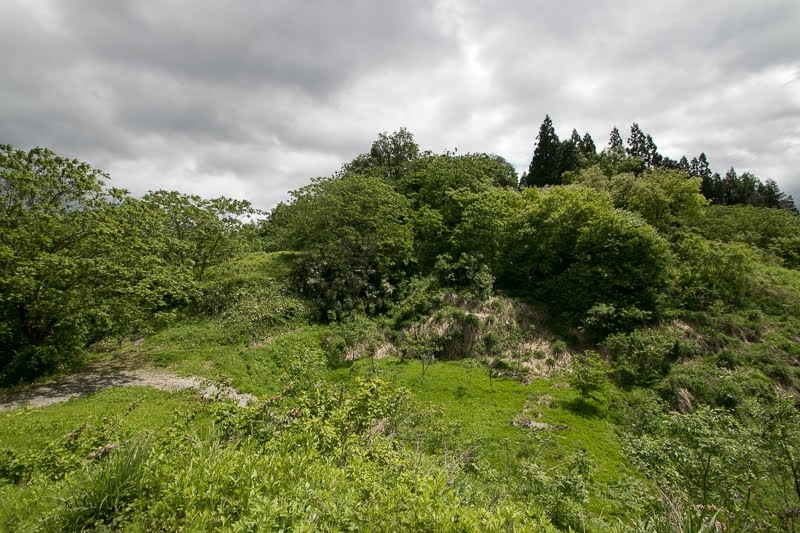 But being attacked overwhelming army of Shiba clan supported by surrounding lords, Sagae army suffered fatal defeat at the battle of Urushigawa, and Aterazawa clan lost their leader along with Sagae clan. 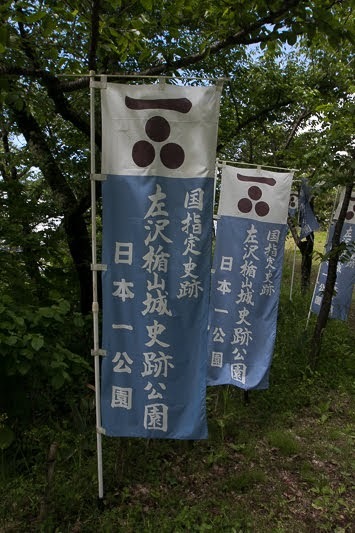 After the battle, Sagae clan and Aterazawa clan followed Shiba clan which changed their surname to Mogami clan. 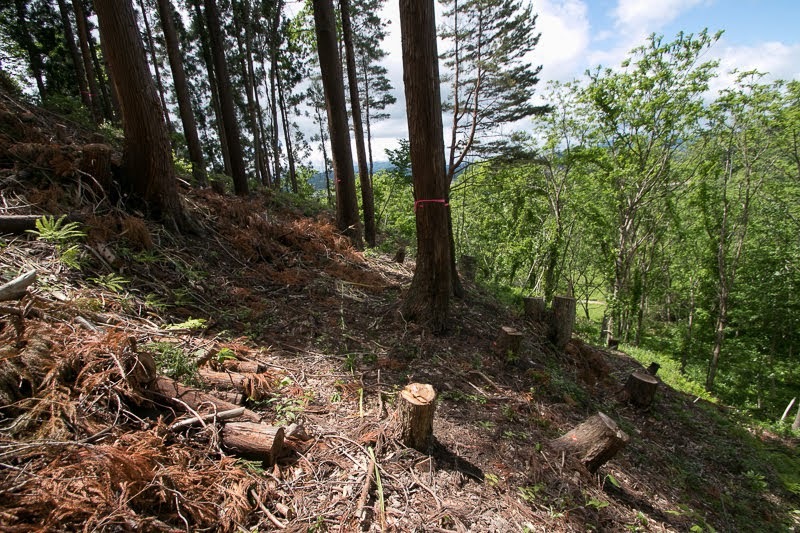 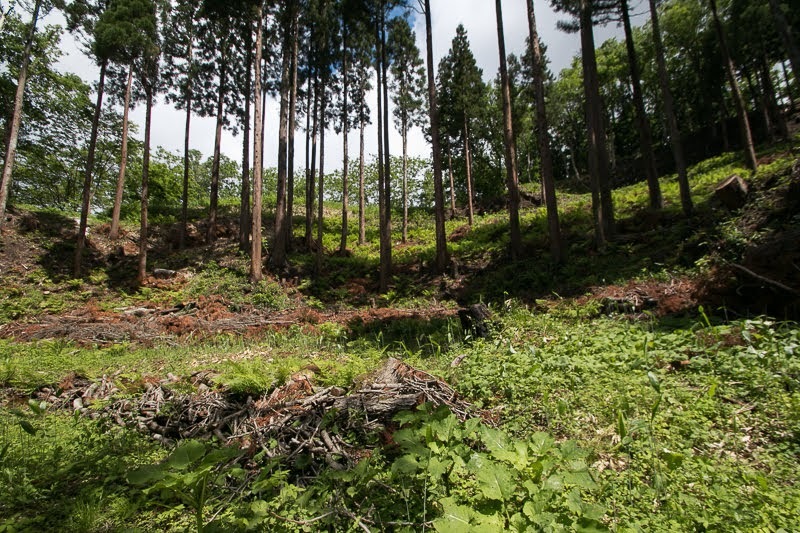 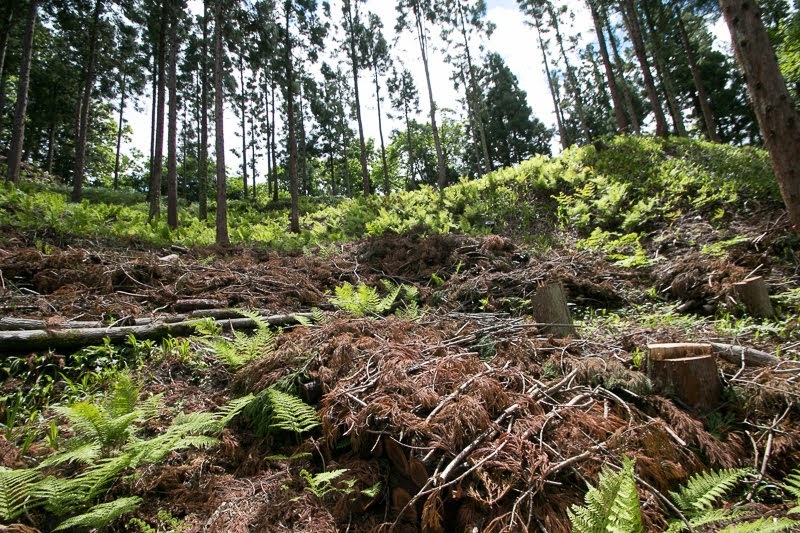 However, next Nagai clan which once captured Yonezawa basin faced intrusion of Date clan, which was the lord of Date area (current Fukushima city area), and finally disappeared from the history in the end of 14th century. Next Date clan moved toward north along with Mogami-gawa river, thus Aterazawa clan directly faced the pressure of Date clan. 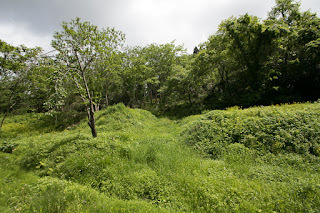 In the end of 15th century, Date clan sent large army to Sagae clan through Mogami-gawa river. However, Aterazawa clan allied with Sagae clan and stroke back the intrusion of Date army. 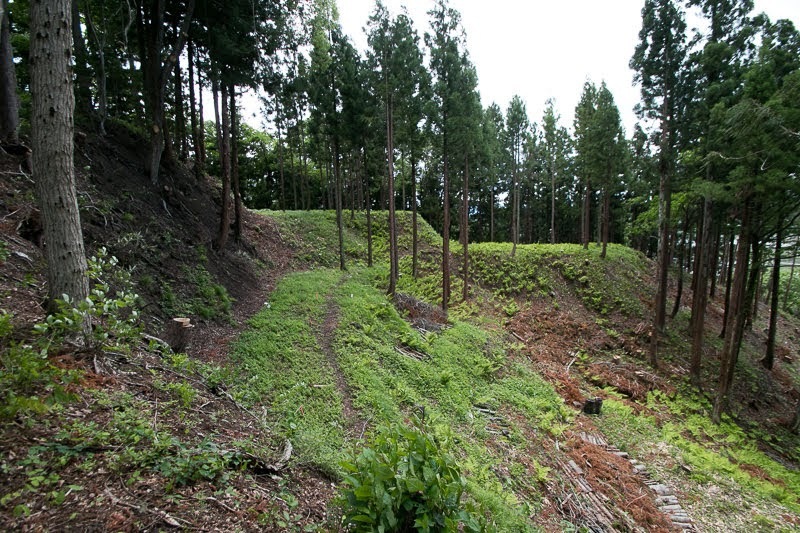 But Sagae clan lured Date army into the center of their territory and broke it by ambush tactics. The situation of Aterazawa clan once stabilized, and Aterazawa Tateyama castle might be expanded expecting further intrusion of Date army. 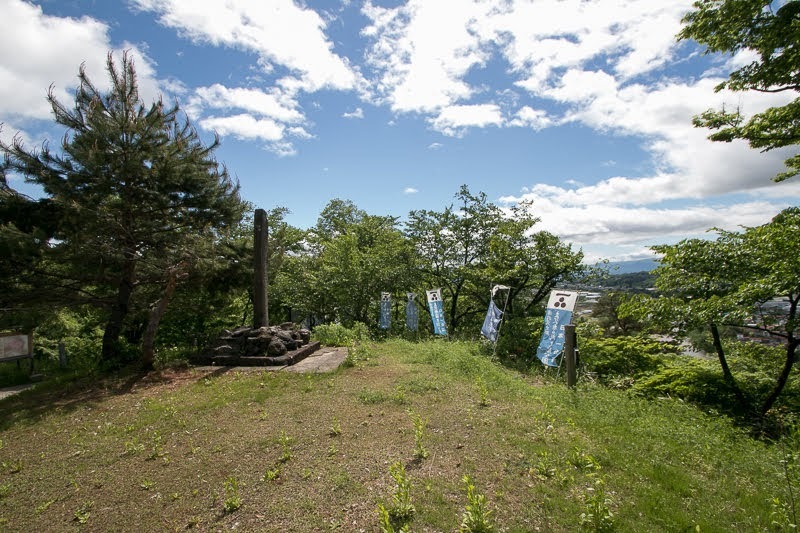 In the former half of 16th century, Date clan further expanded their territory under Tanemune Date (1488-1565), and Mogami clan lost their power because of internal conflict. 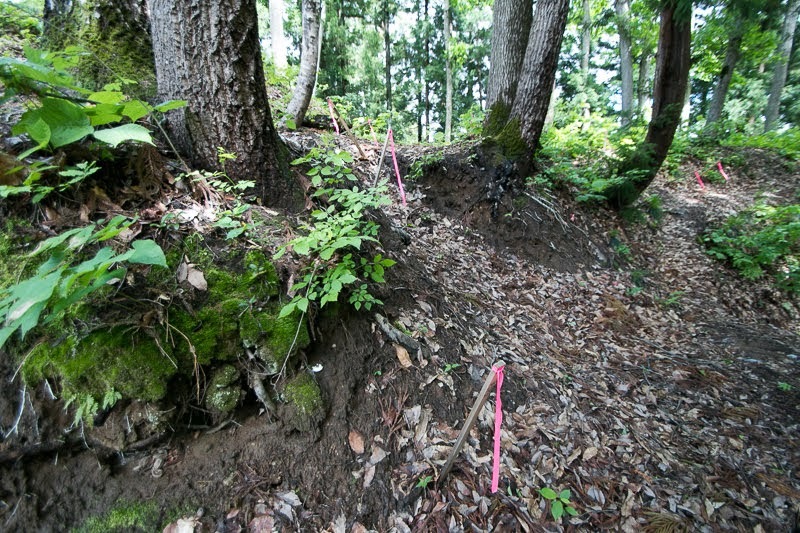 In 1514, Date army broke Mogami army at the battle of Hasedo and forced Mogami clan to follow to Date clan. Next Date army attacked Sagae clan, and Sagae clan had to coordinate with Date clan and virtually became the retainer of Date clan. 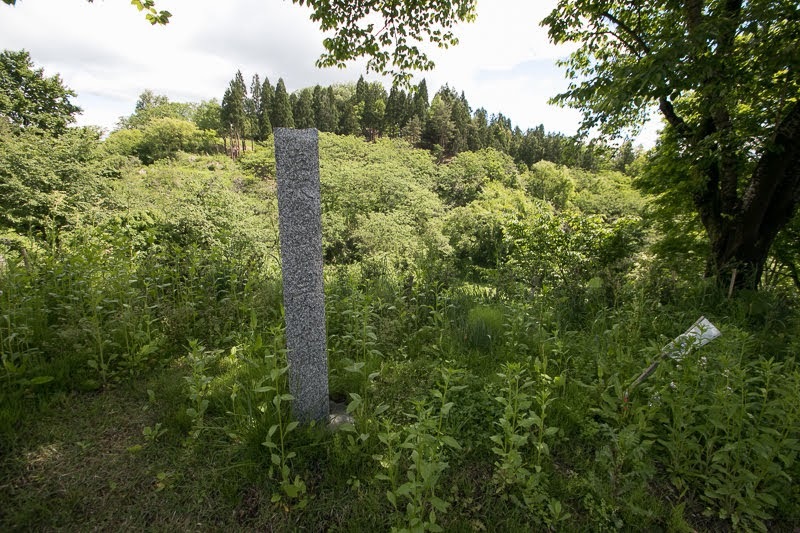 However, Date clan significantly lost their power because of their internal conflict between Tanemune Date and his son Harumune Date (1519-1578). Mogami clan recovered their independence but their power was still weak, thus Yamagata plain was separately managed by group of local lords such as Tendo clan or Tateoka clan. 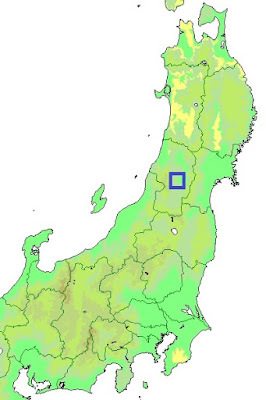 Even though small, Sagae clan and Aterazawa clan stood at the west of Yamagata basin. In 1570’s, Yoshiaki Mogami (1546-1614) who overcame internal conflict with his father Yoshimori Mogami (1521-1590) and succeeded the leader of the clan, started his campaign to unite Yamagata basin and recover former glory of Mogami clan. 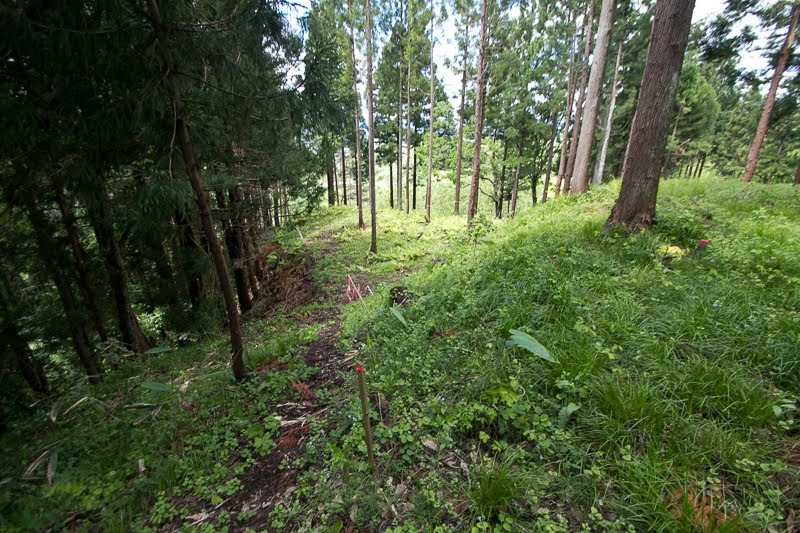 Being suffered from small army, Yoshiaki gradually grew their power by negotiations and plots to break his rival Tendo clan. 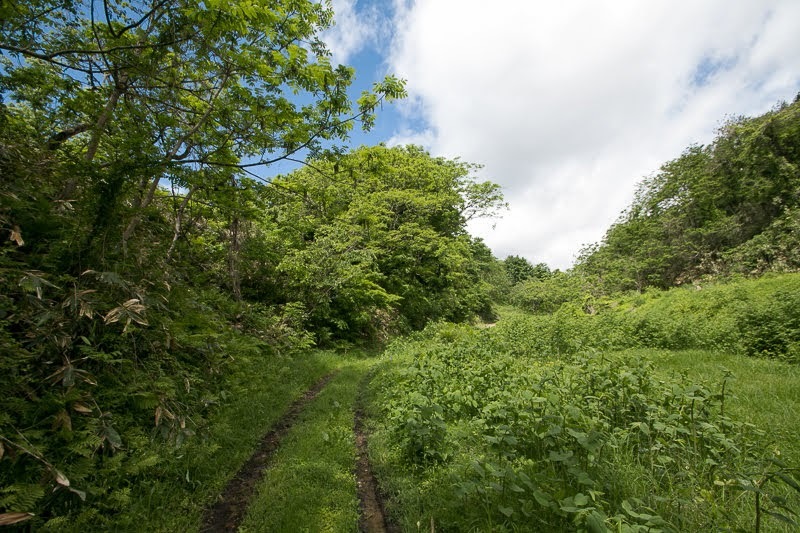 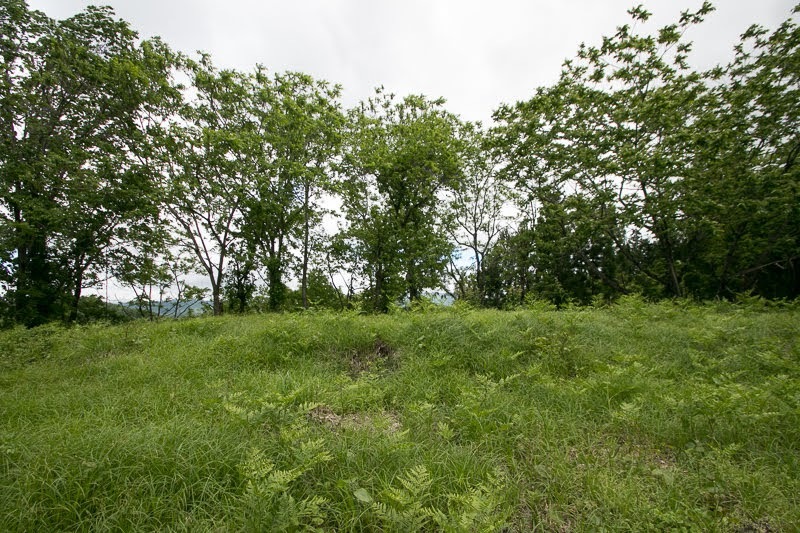 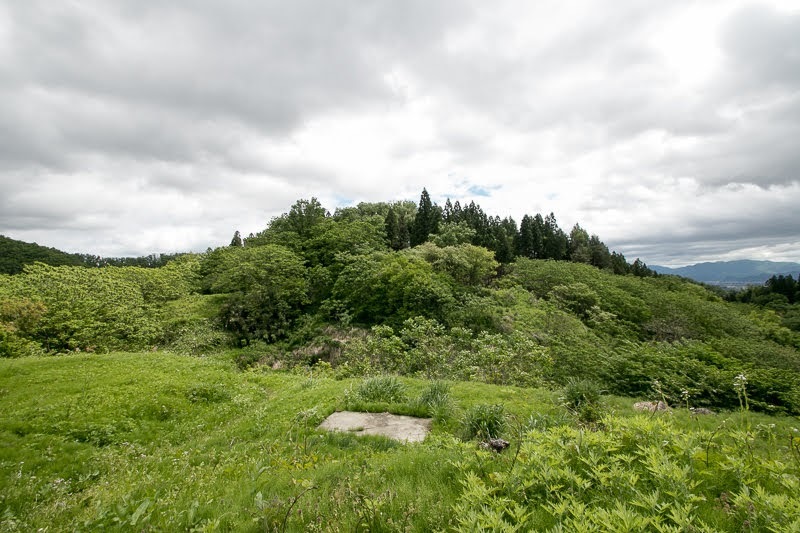 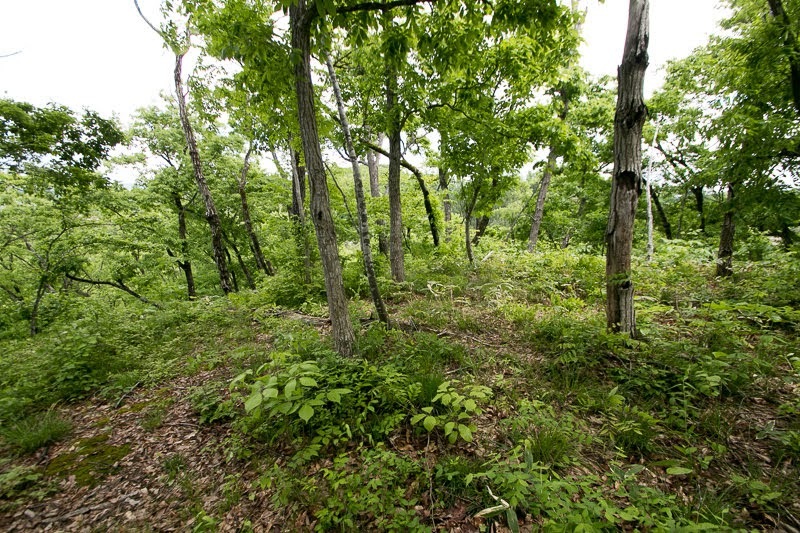 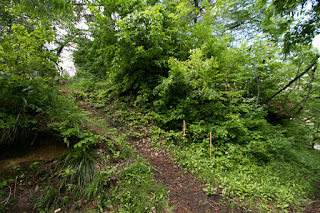 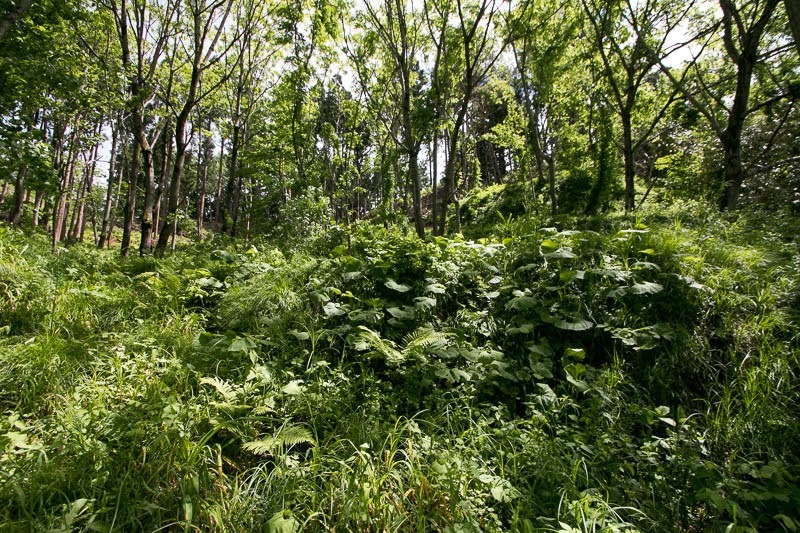 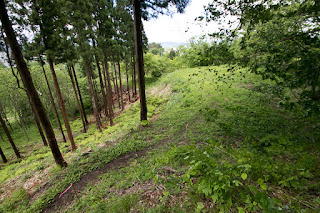 In 1584, Mogami clan attacked Sagae clan to fix the backside and suppress Daihoji clan, the lord of Sakata plain at the opposite of Gassan mountain from Sagae area. 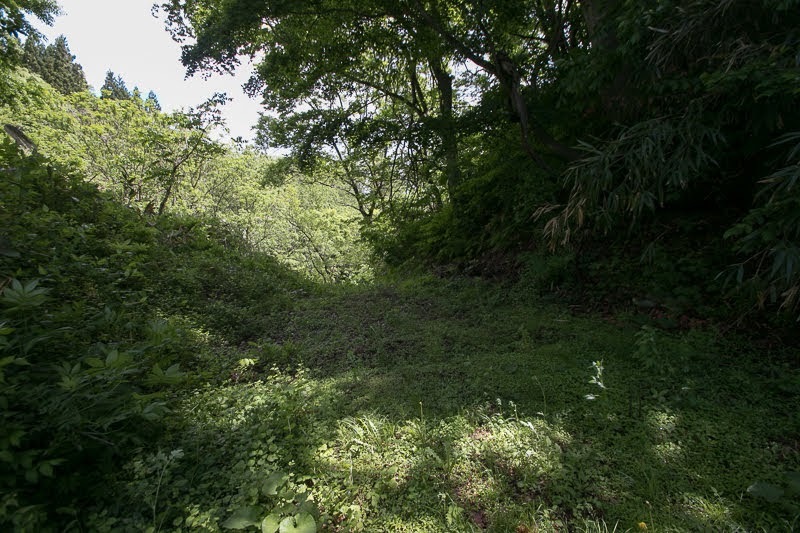 Sagae clan gathered their relatives including Aterazawa clan and resisted, but was broken by Mogami army then disappeared from history. At this time Aterazawa clan fell along with Sagae clan. 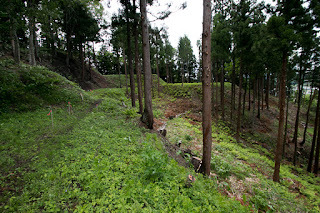 Mogami clan which captured Aterazawa Tateyama castle reformed it as a base of local administration and river control. 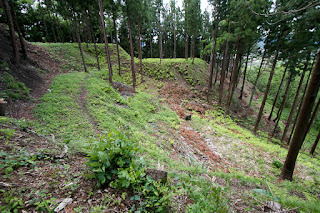 Aterazawa Tateyama castle roughly consist of long and narrow hill of 400 meter long faces Mogamigawa-river, and backside hill area ahead of the valley of small creek. 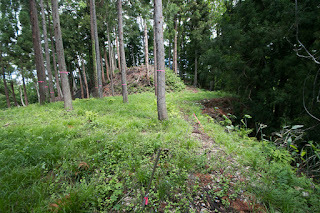 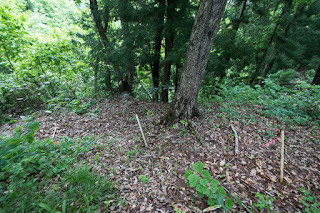 Front side narrow hill is separated into layer of terraces such as Hachiman-daira or Senjojiki, which are simply divided by clay wall. 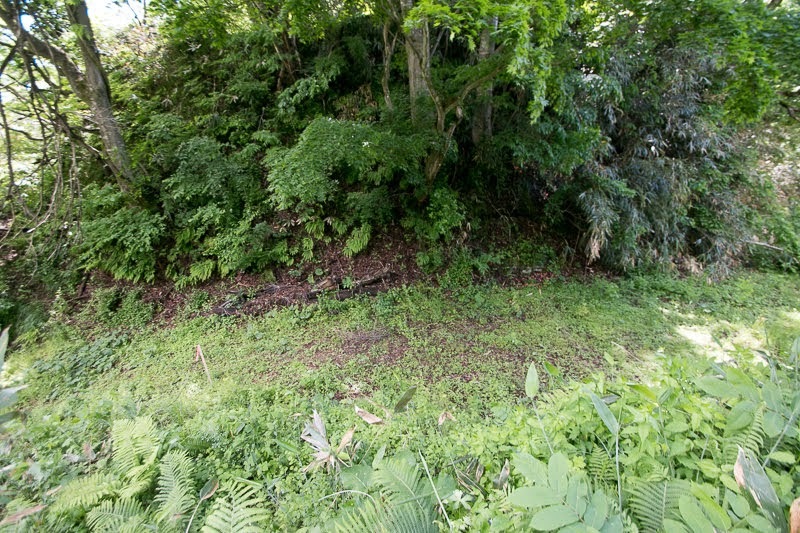 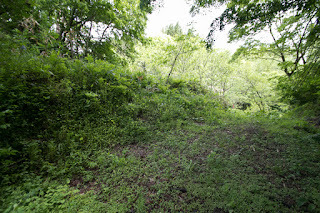 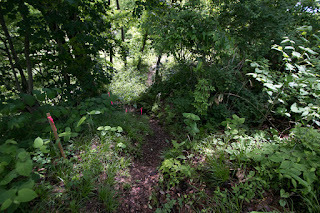 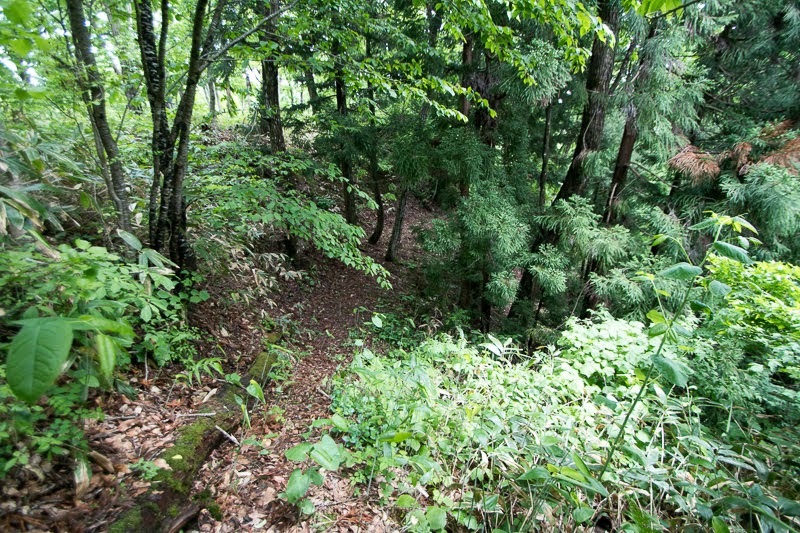 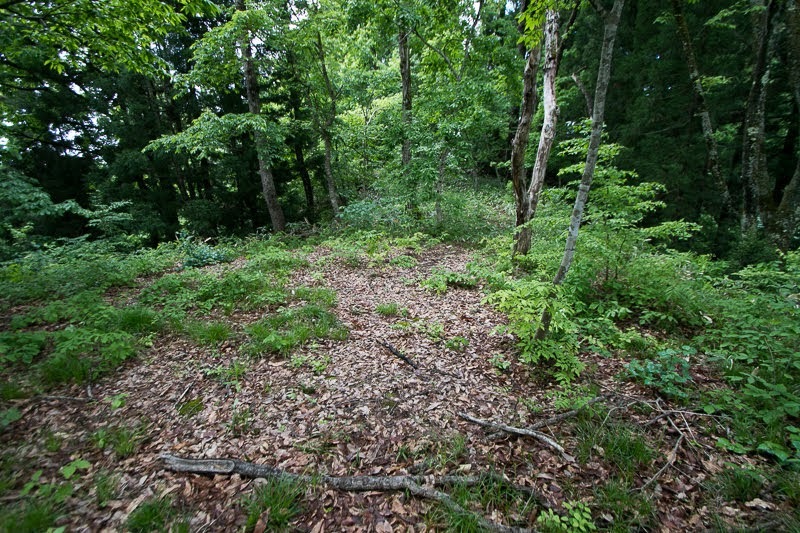 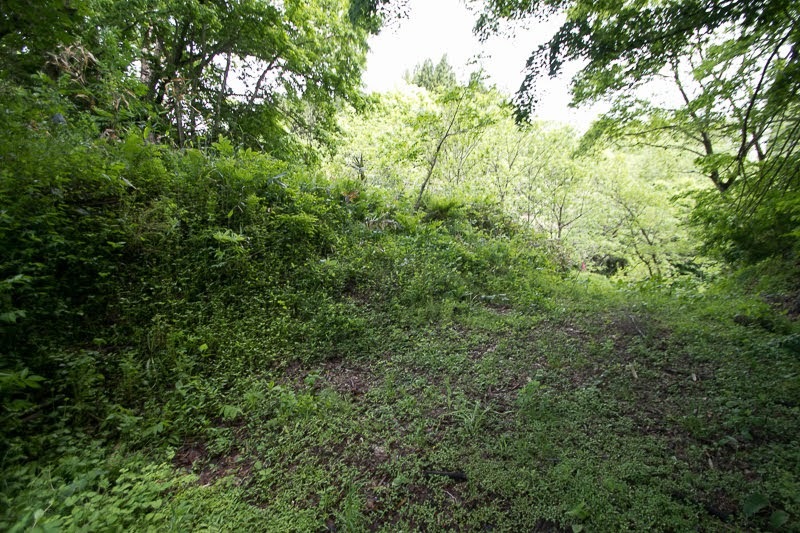 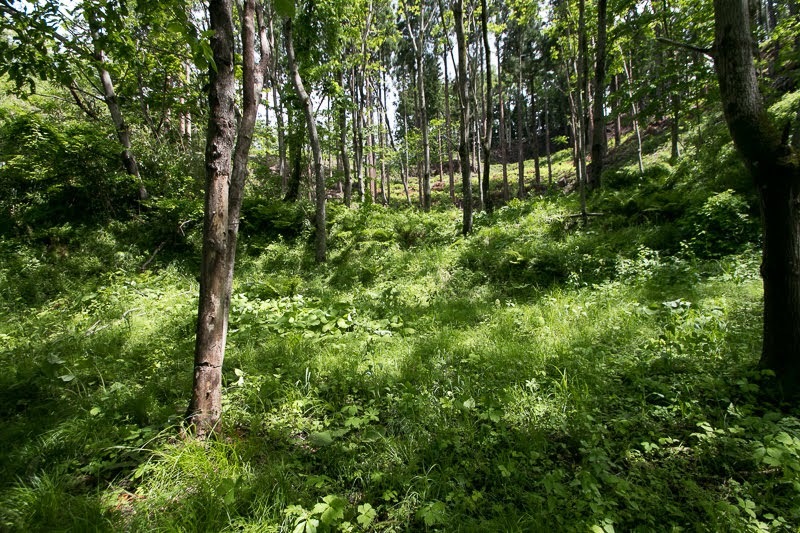 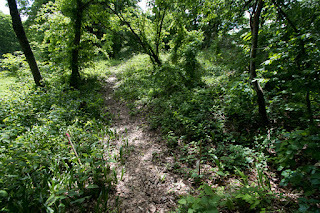 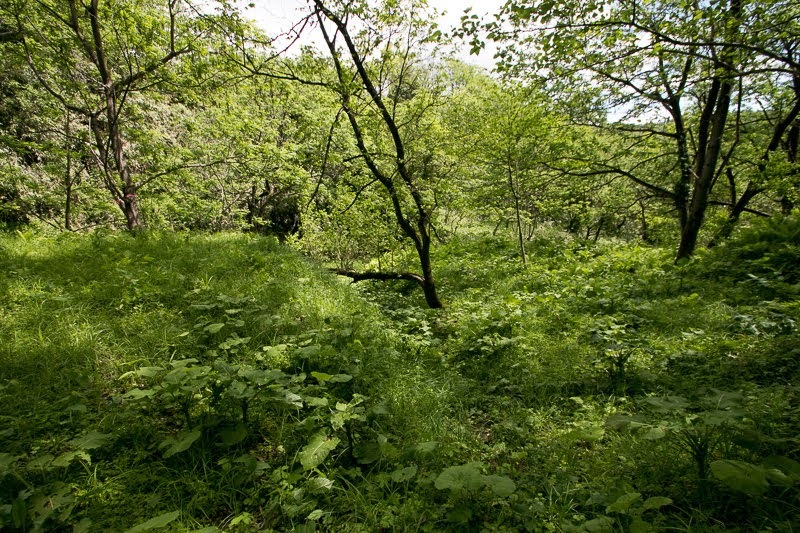 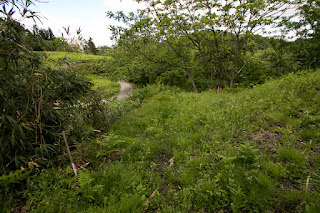 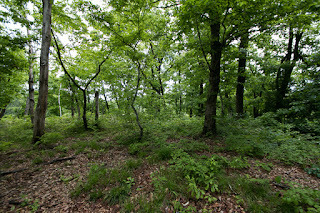 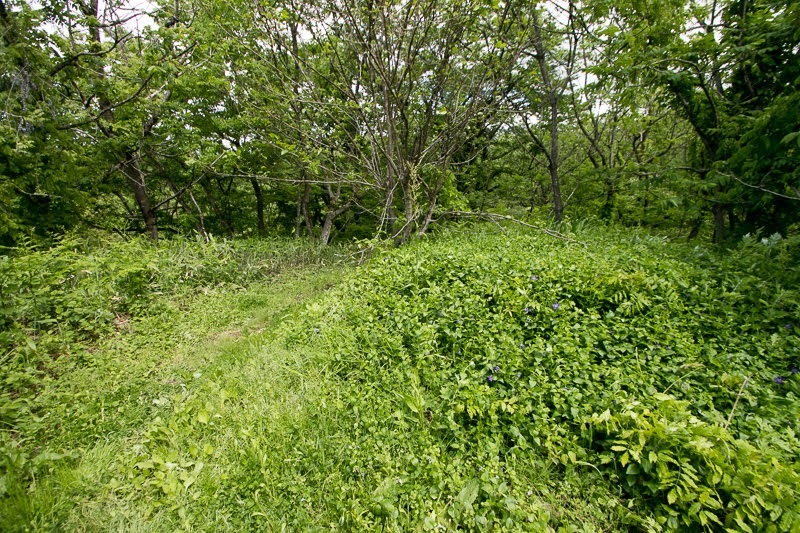 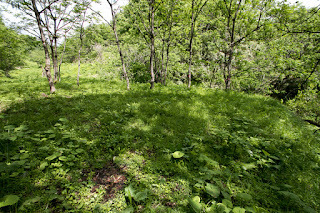 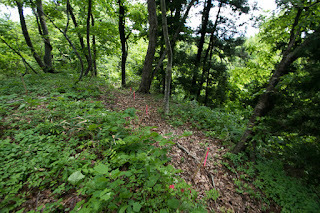 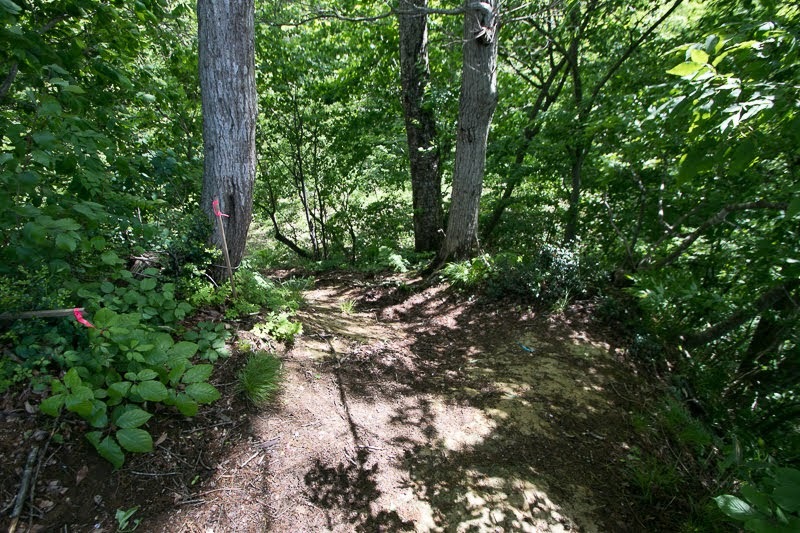 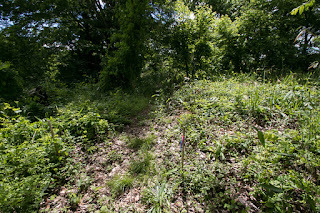 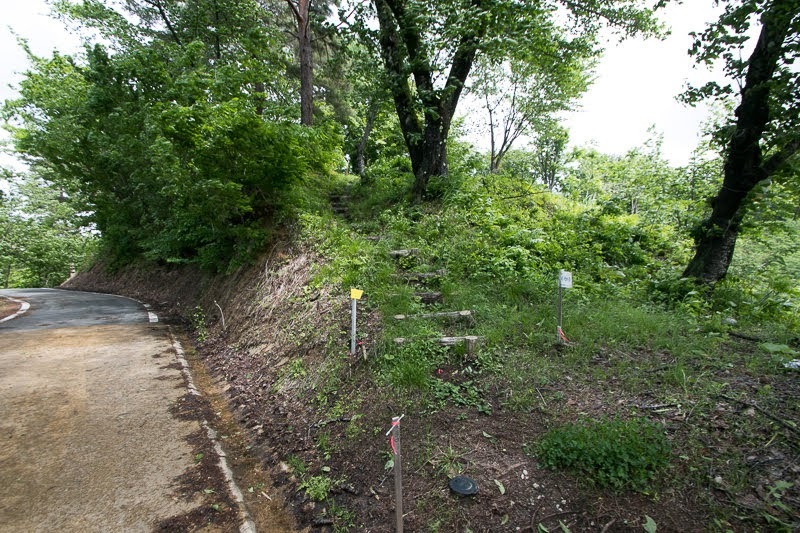 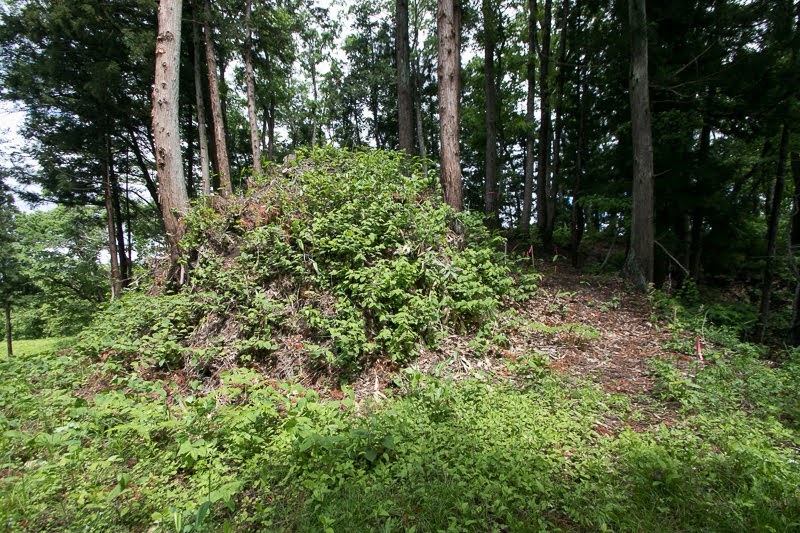 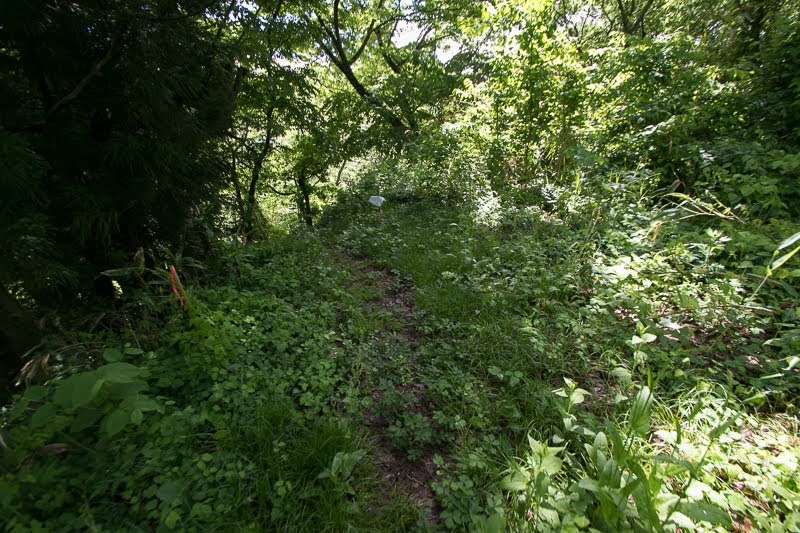 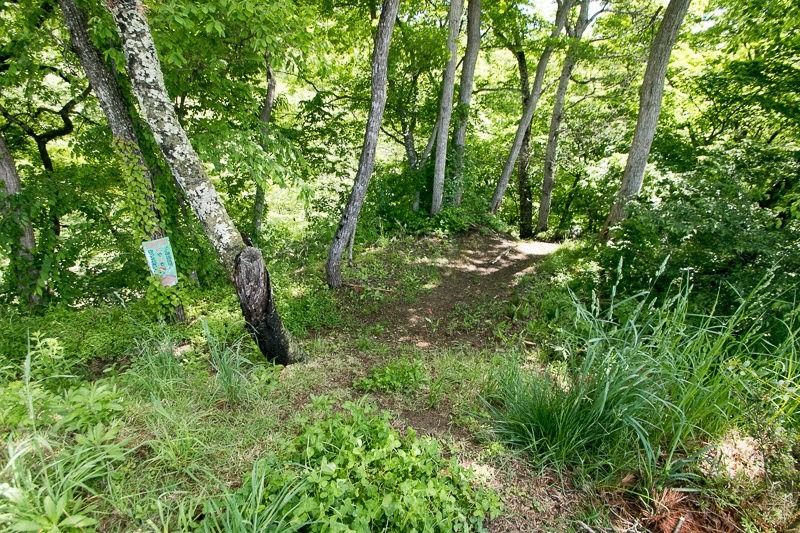 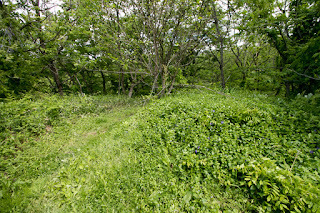 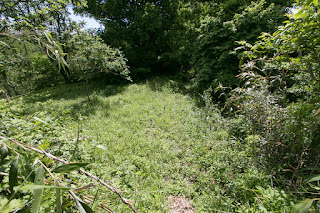 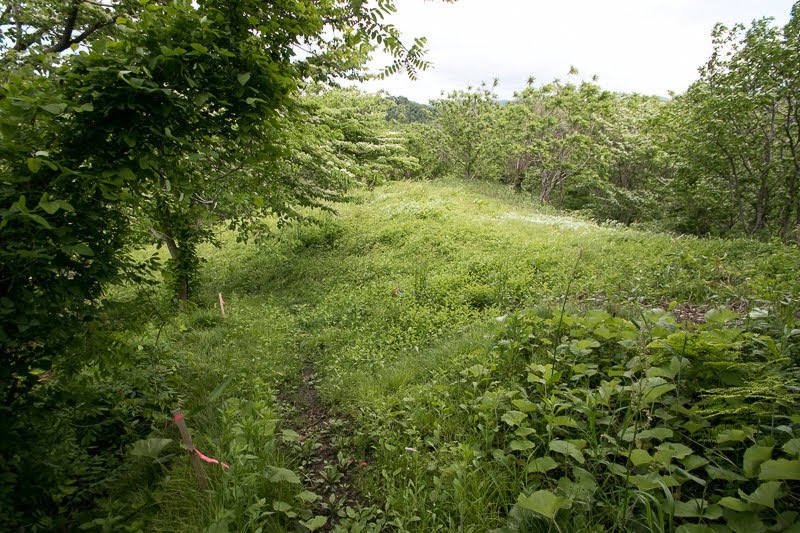 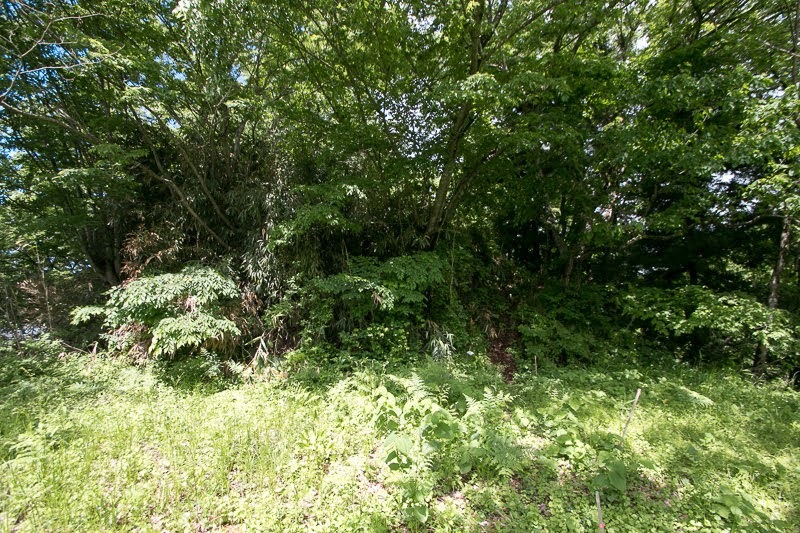 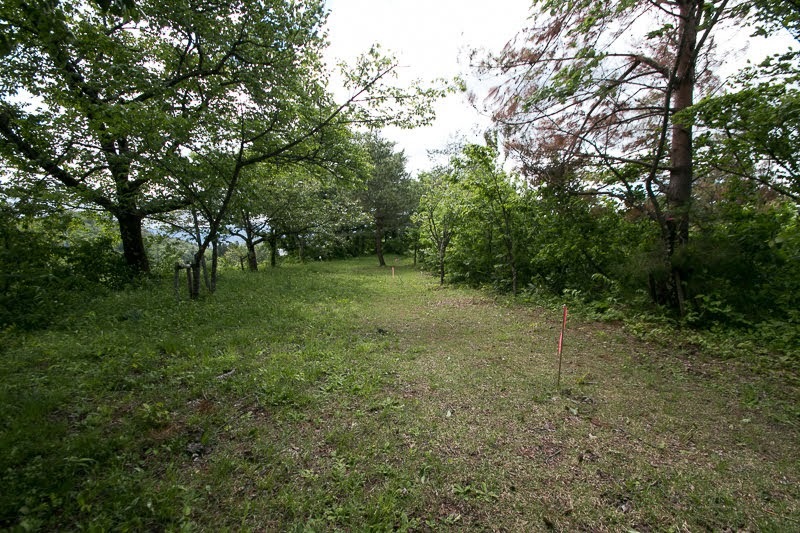 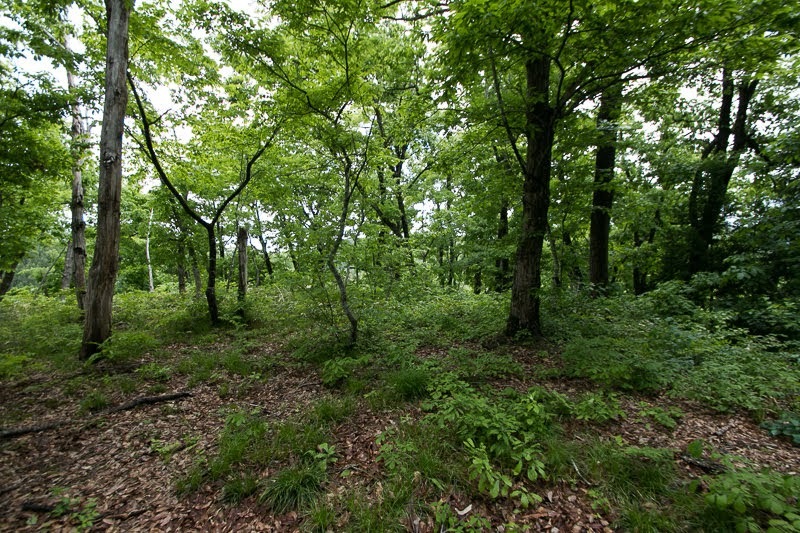 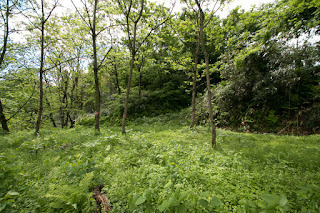 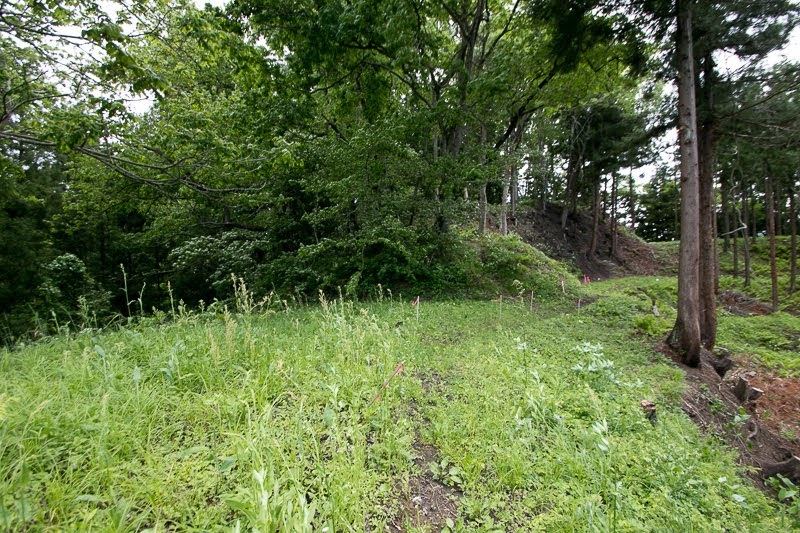 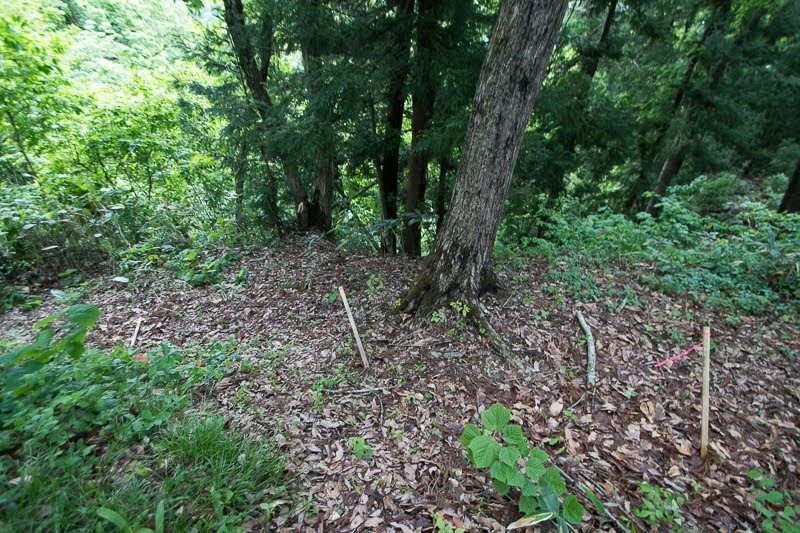 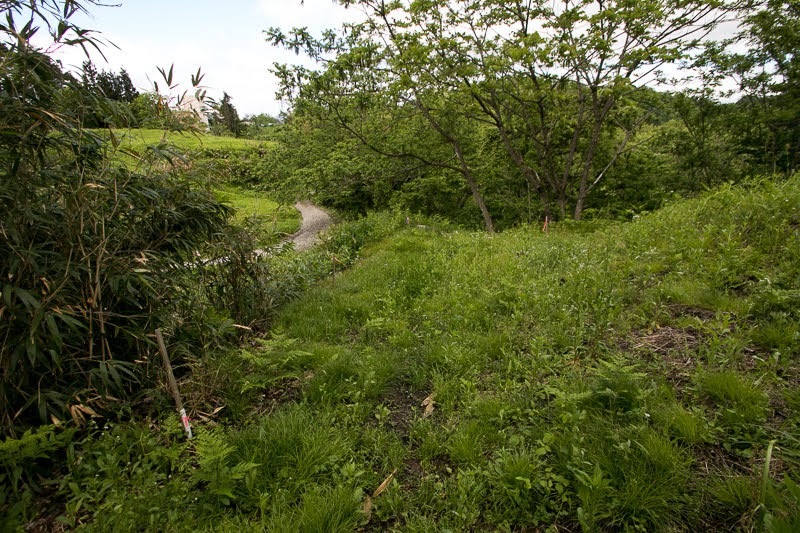 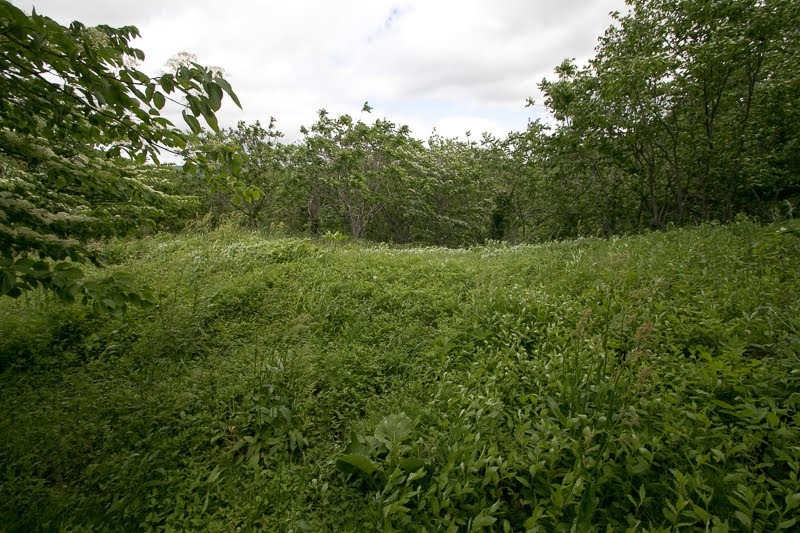 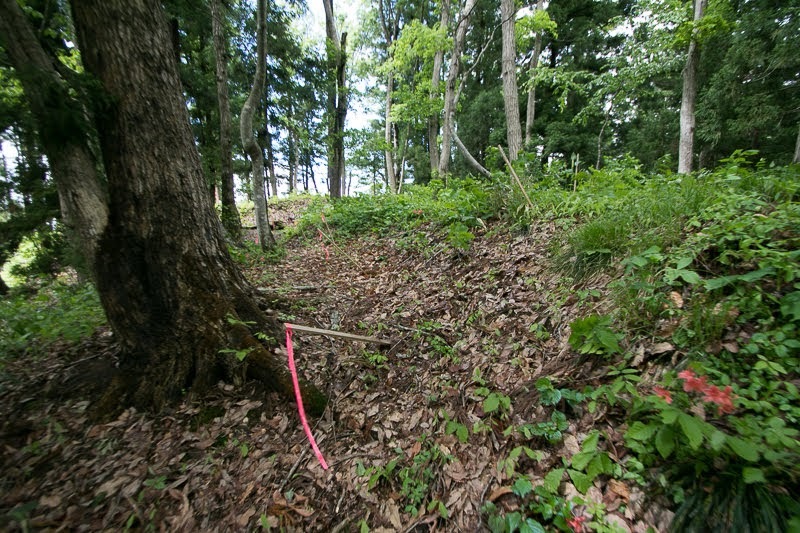 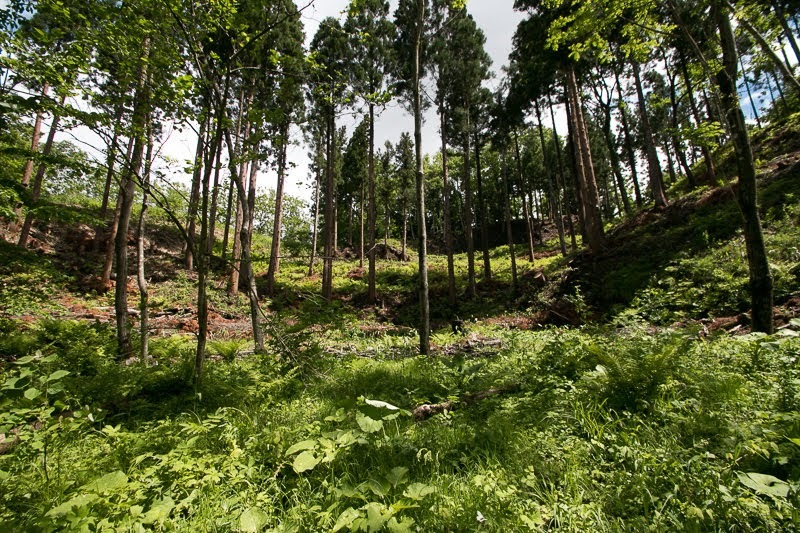 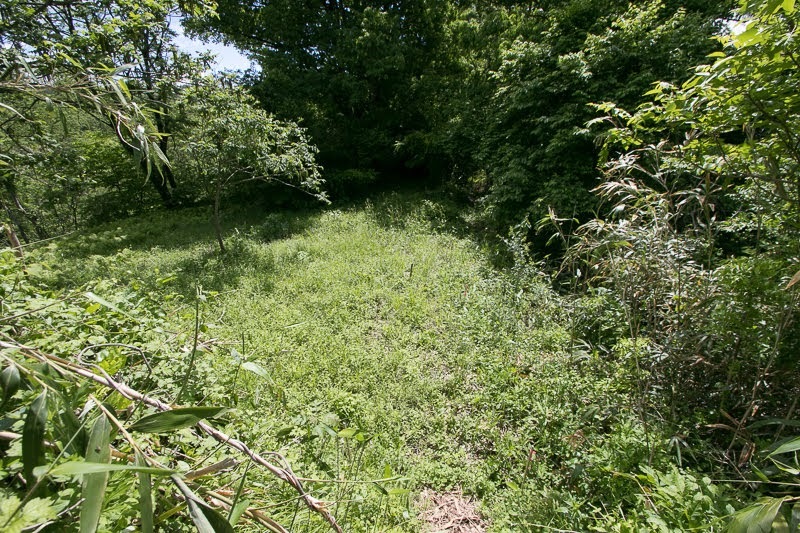 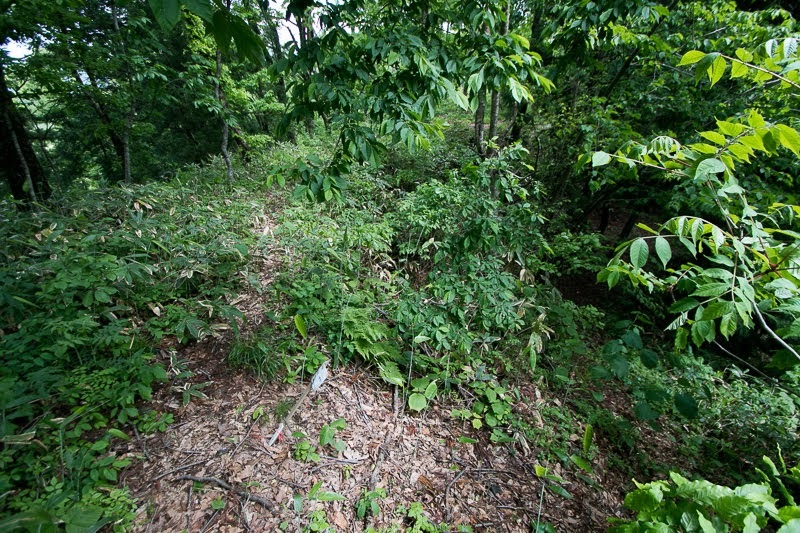 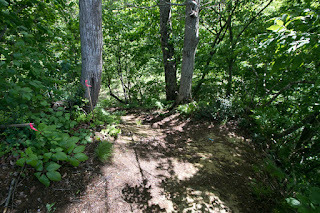 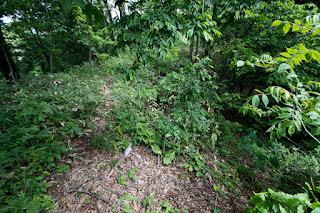 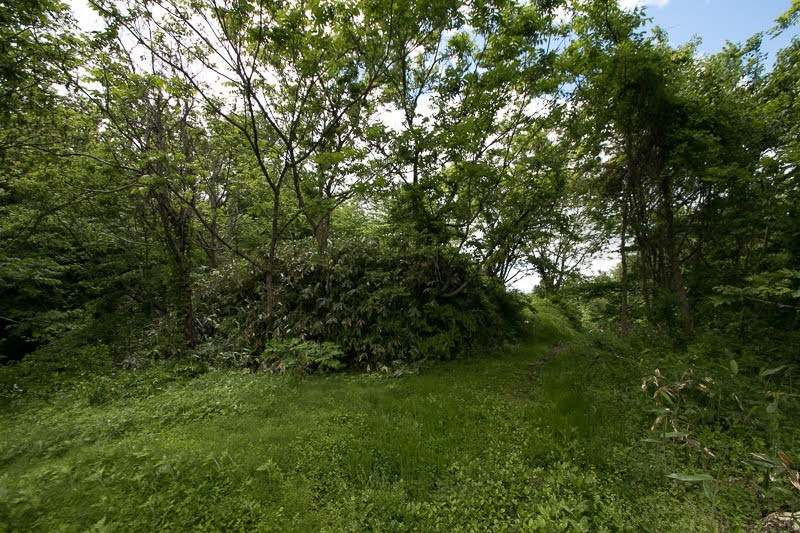 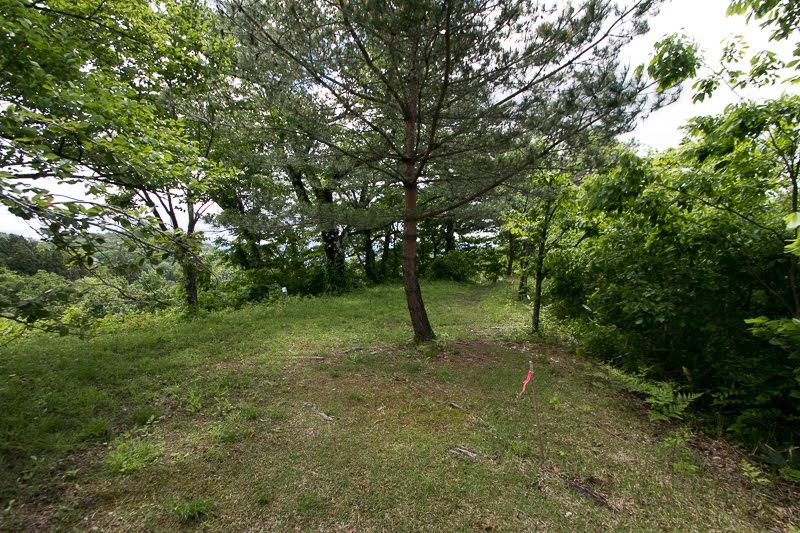 These area might be the castle area under Aterazawa clan. 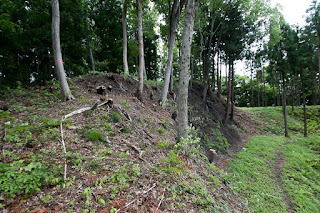 Vertical dry moats are built at the slope faces the river, to show the dignity toward the river and prevent the climbing from ships. 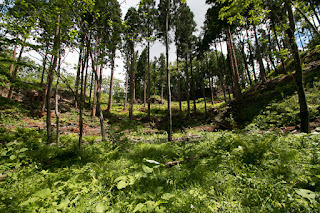 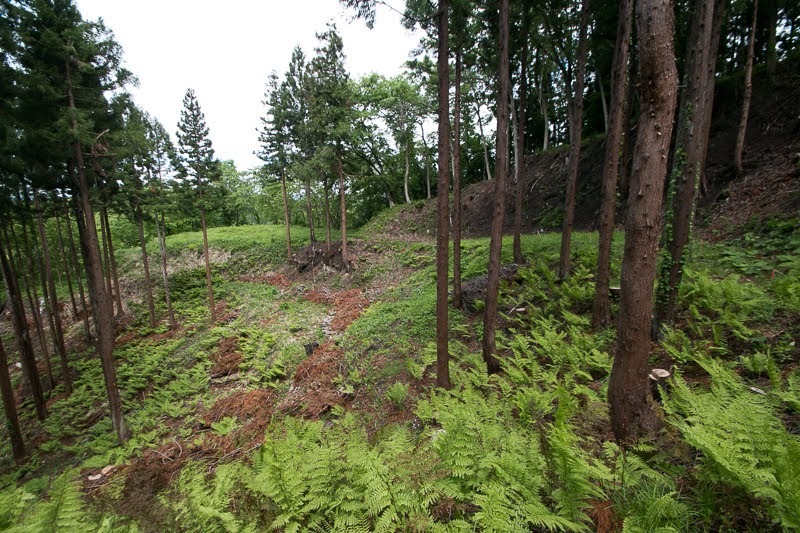 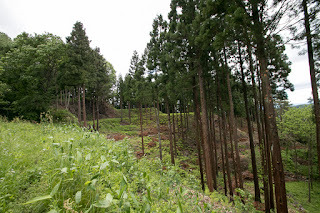 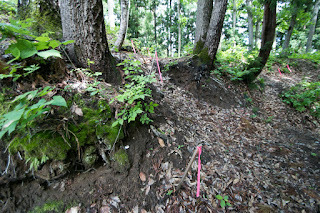 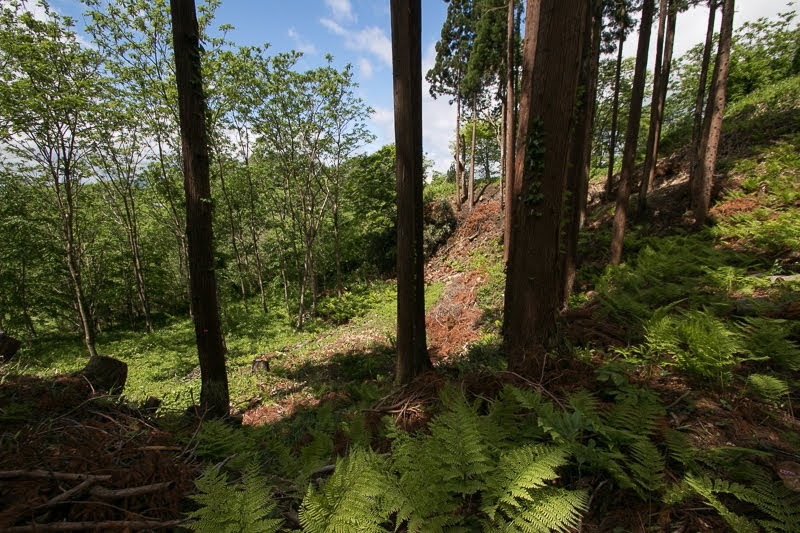 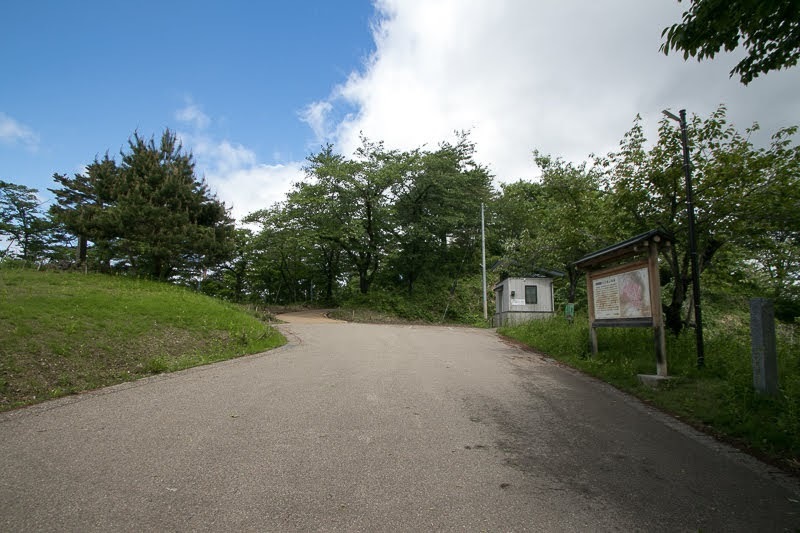 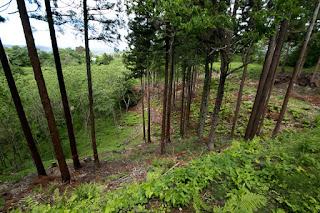 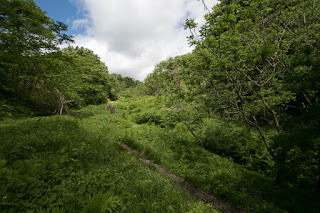 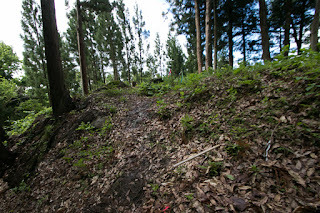 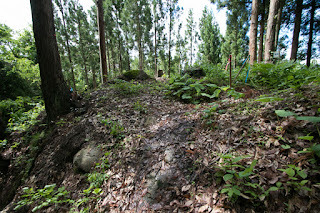 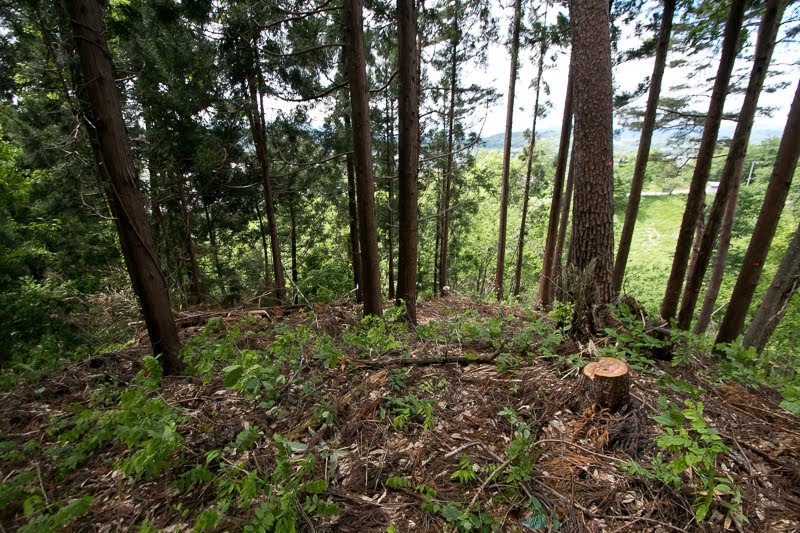 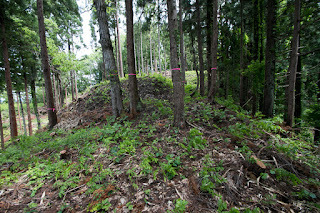 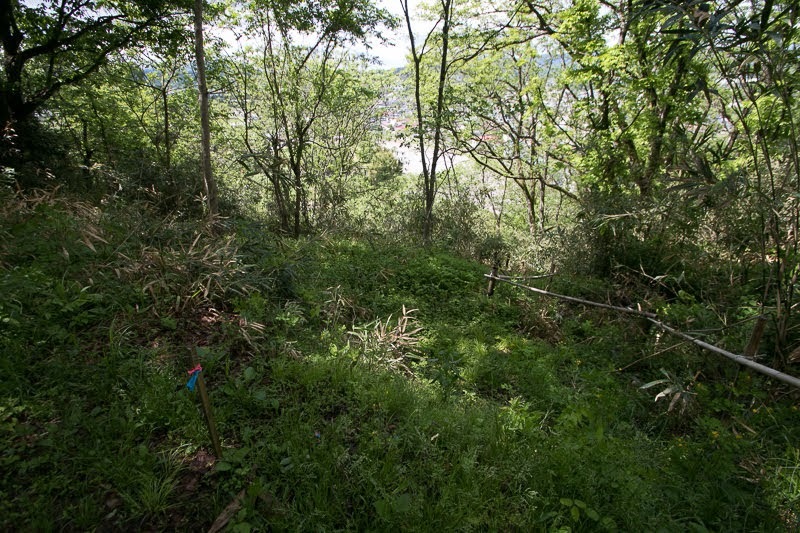 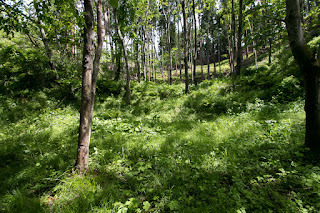 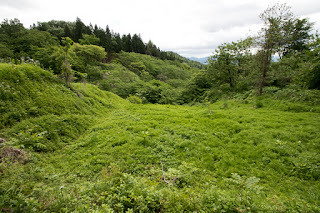 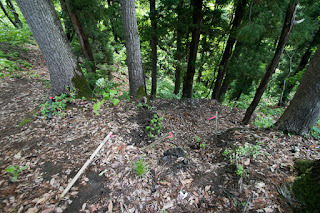 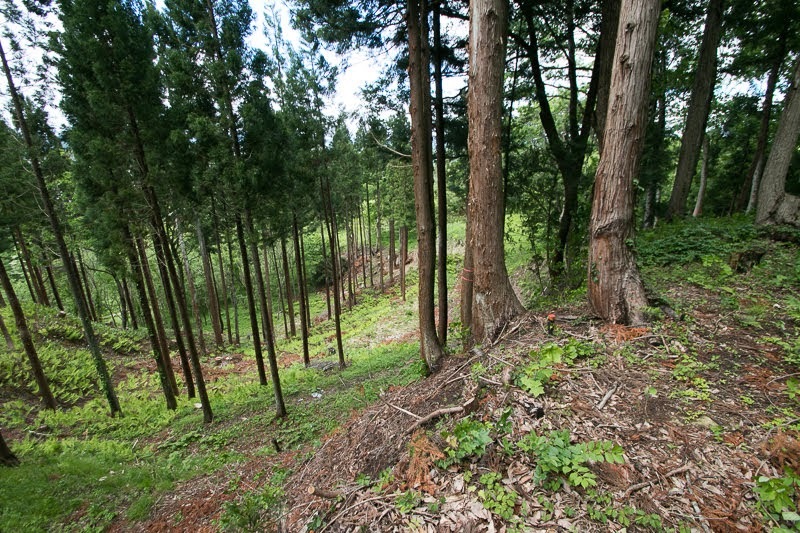 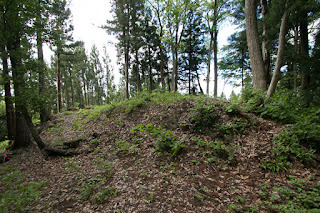 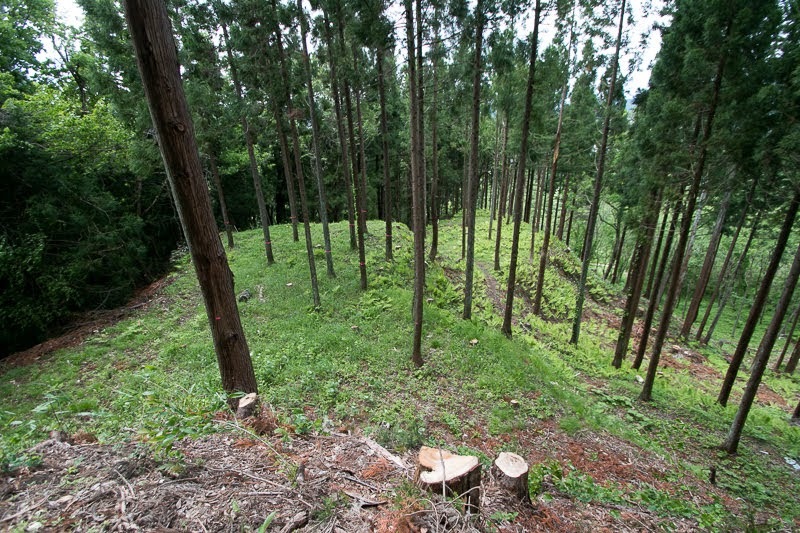 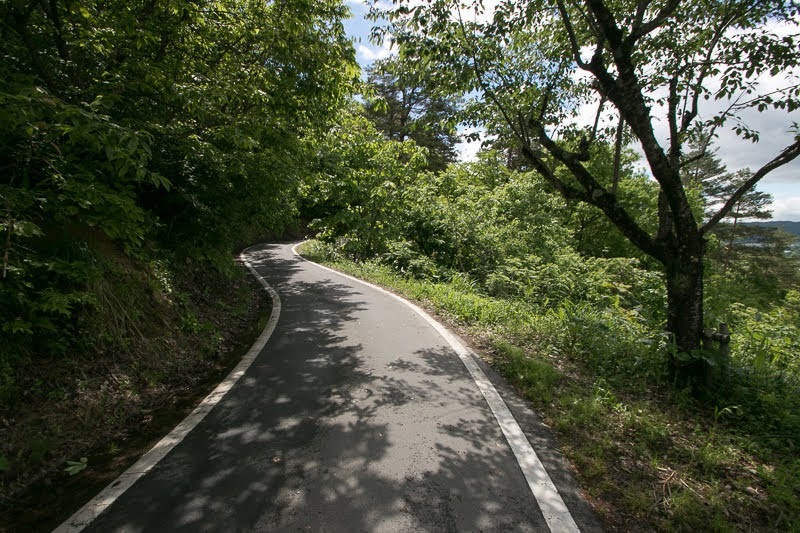 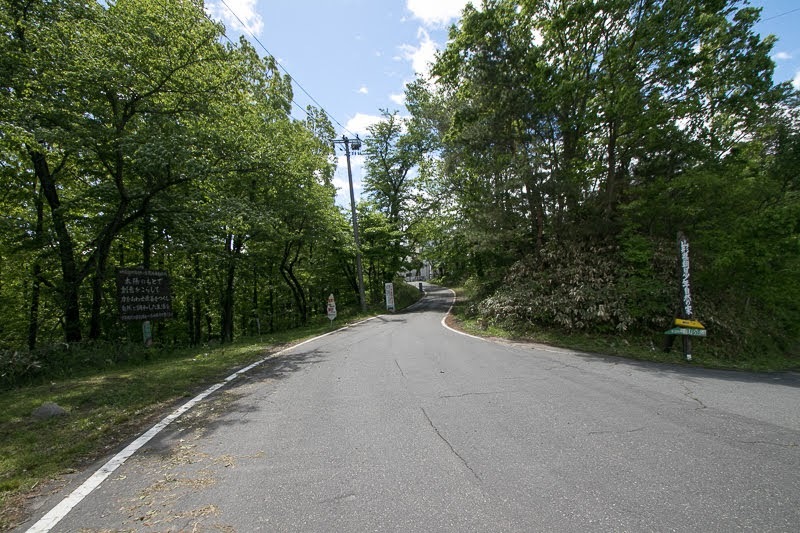 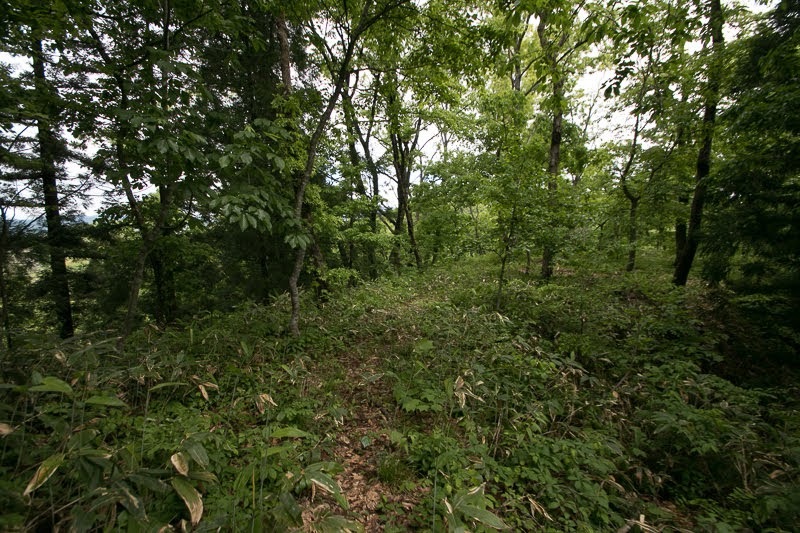 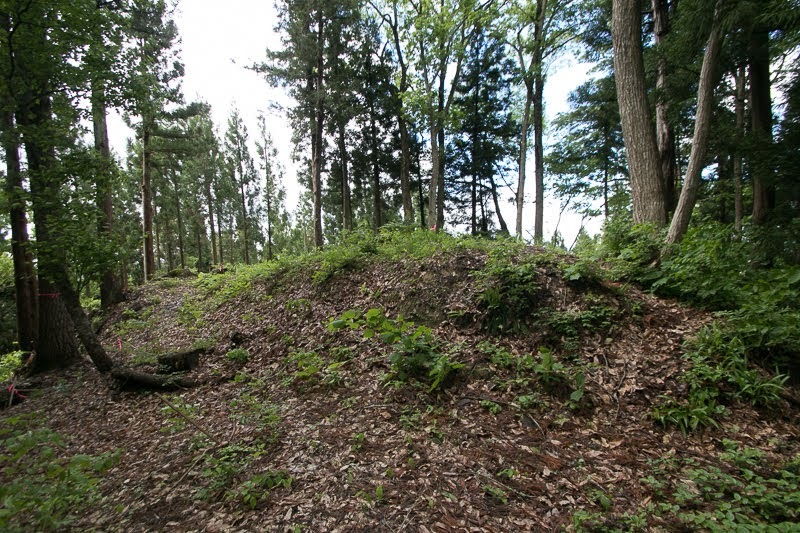 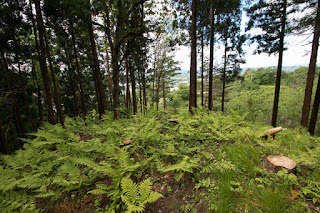 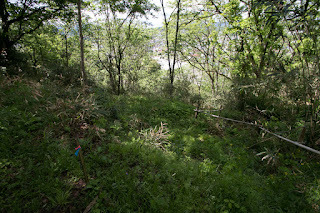 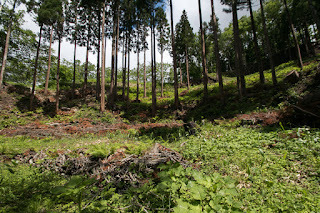 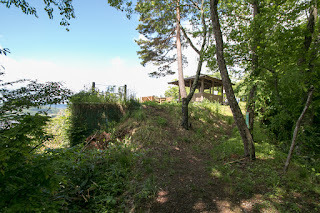 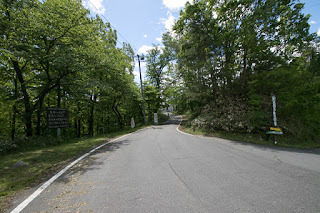 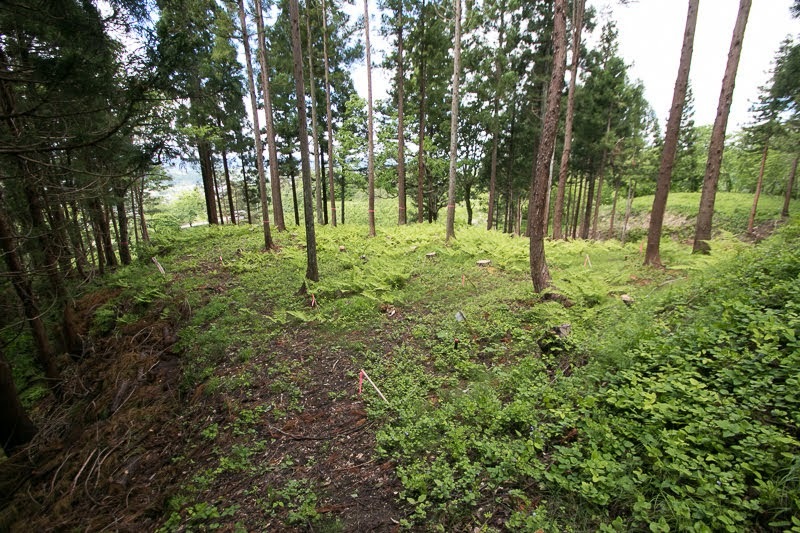 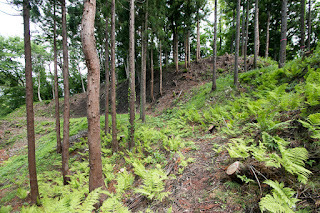 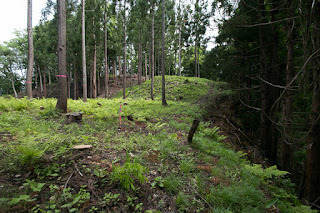 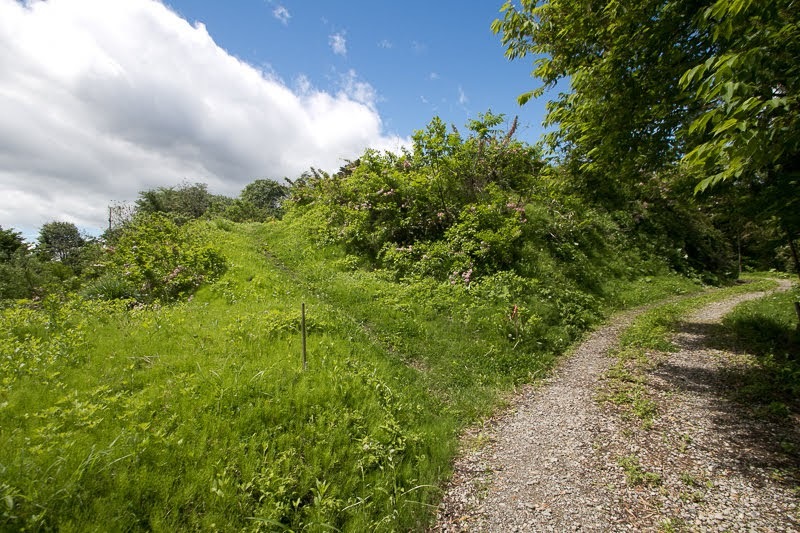 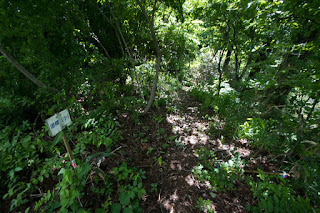 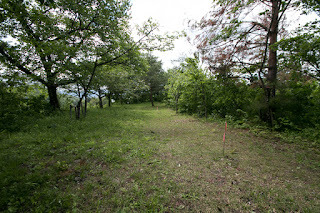 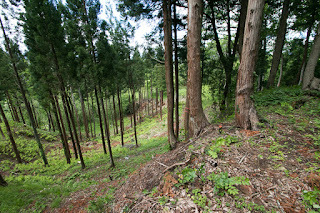 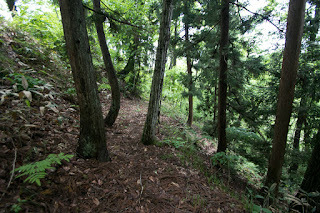 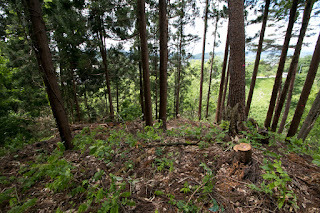 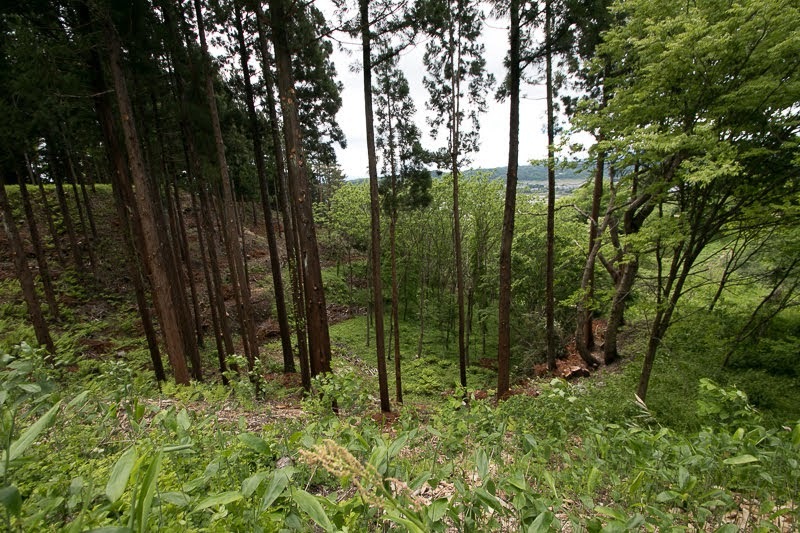 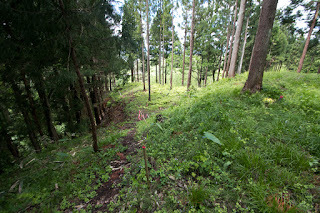 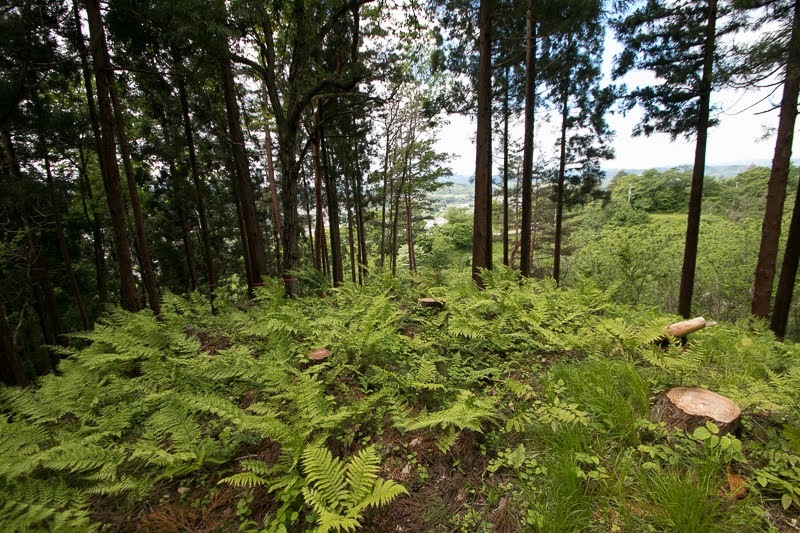 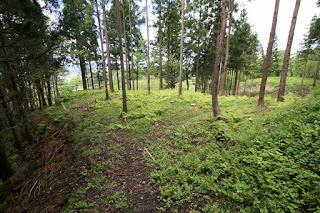 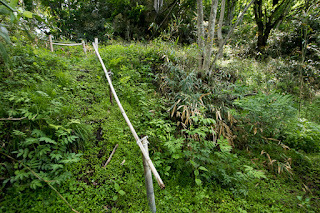 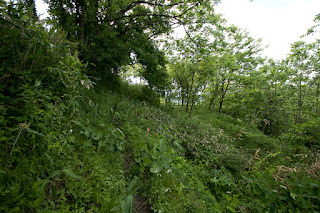 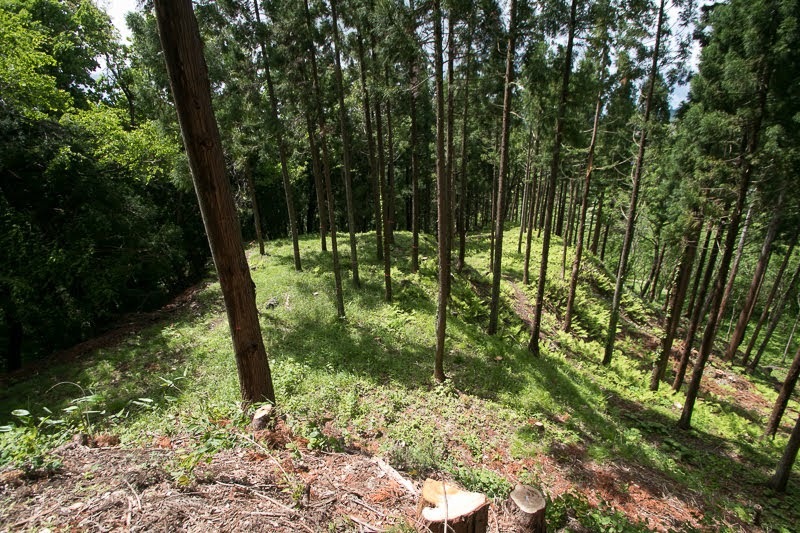 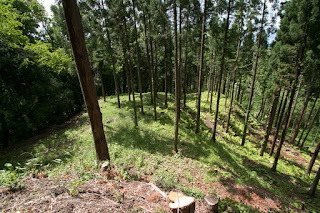 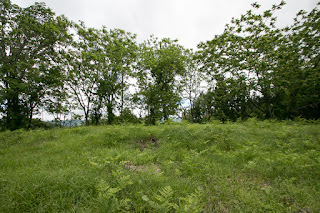 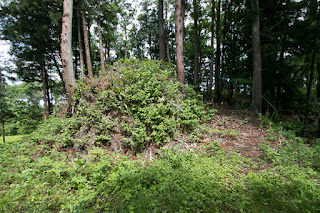 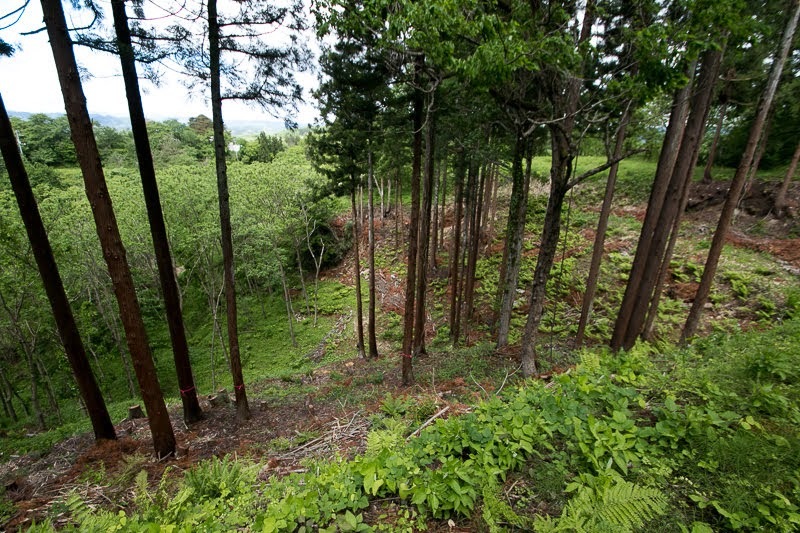 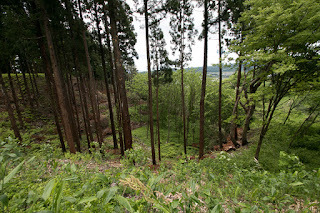 On the other hand, backside hill is well constructed area under Mogami clan. 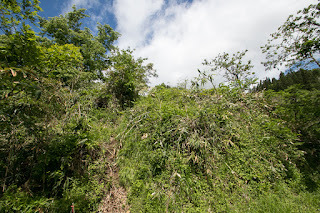 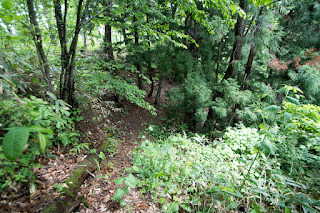 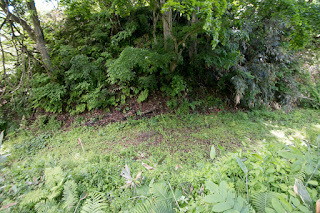 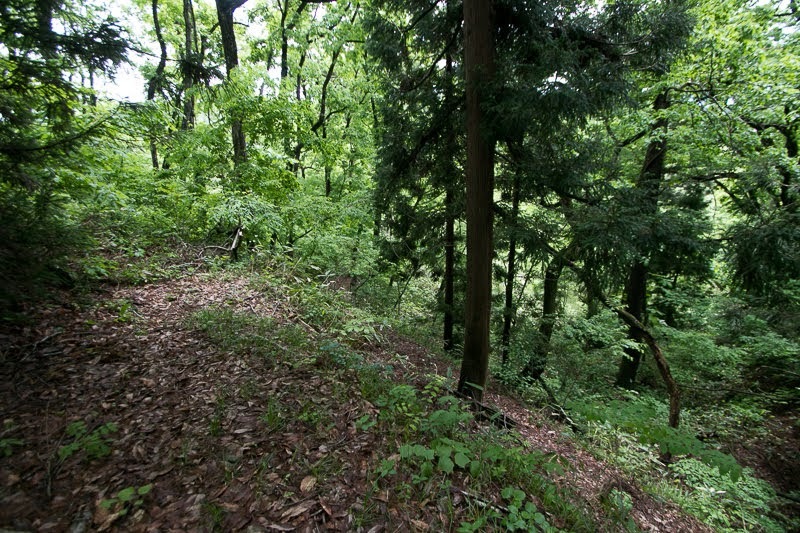 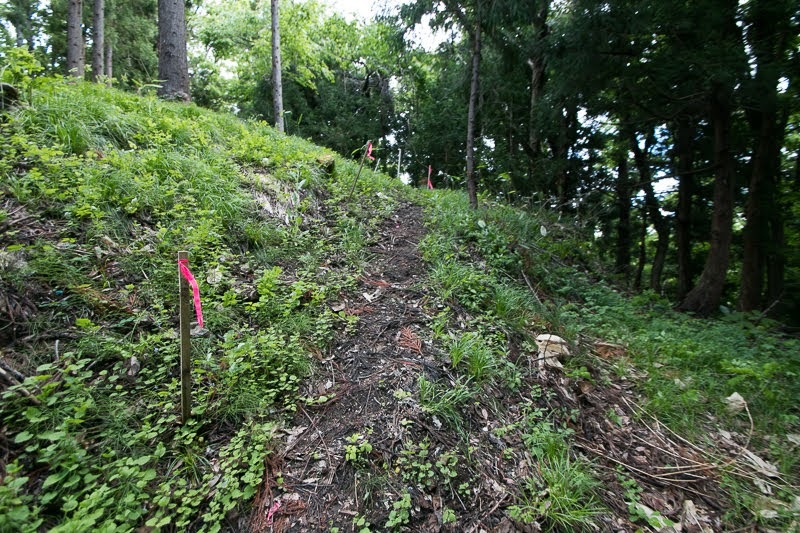 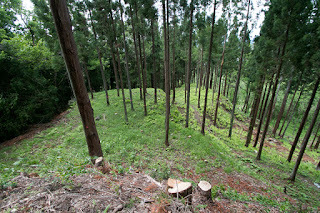 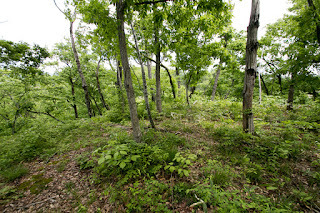 From the peak of the hill which is reverse U shape, many terraces are built at the slope of the hill. 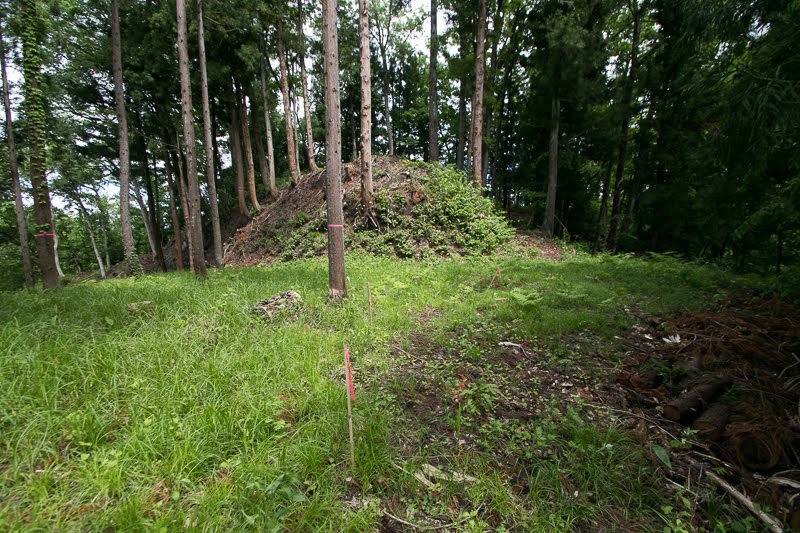 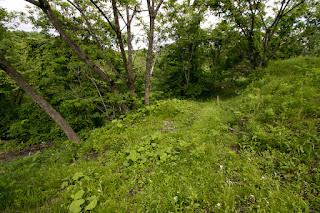 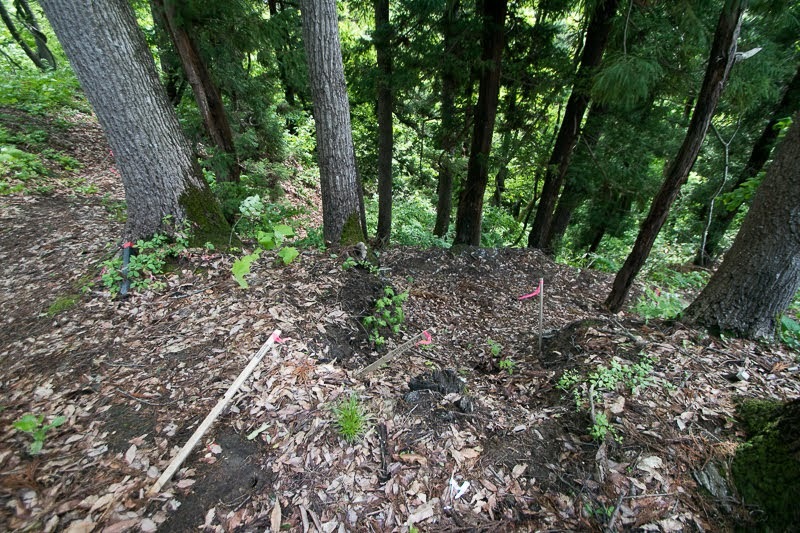 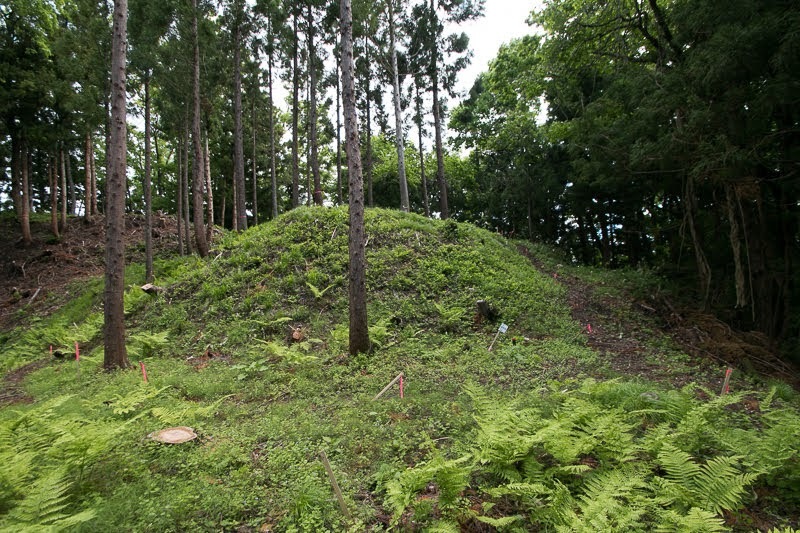 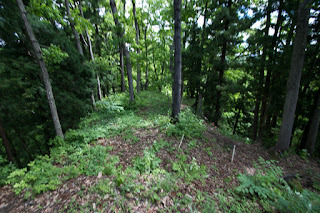 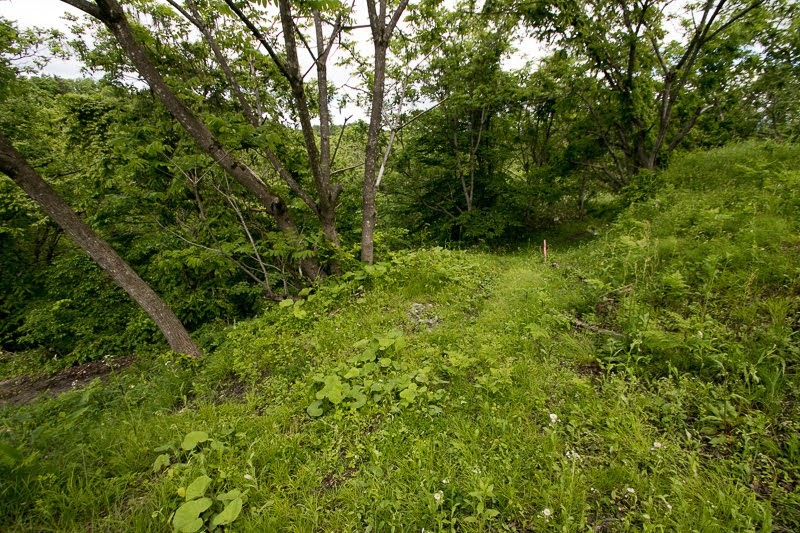 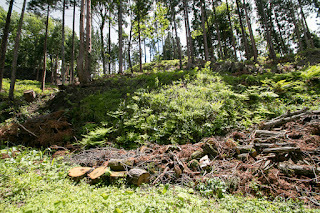 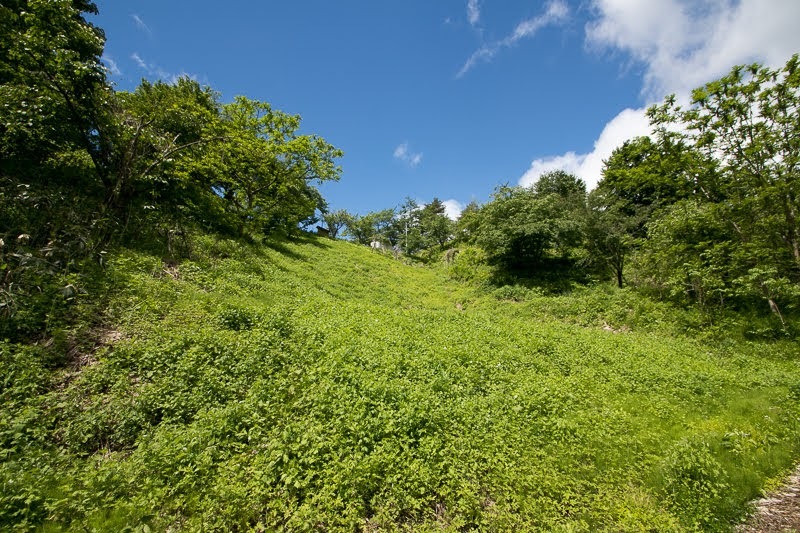 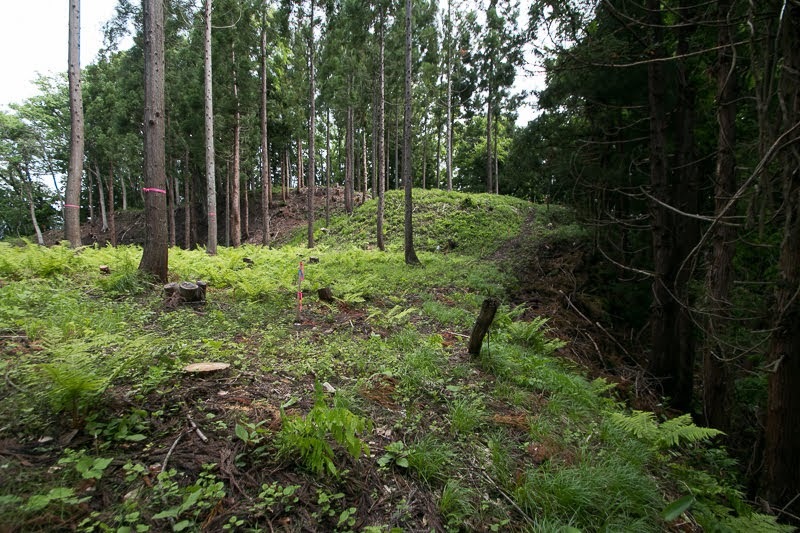 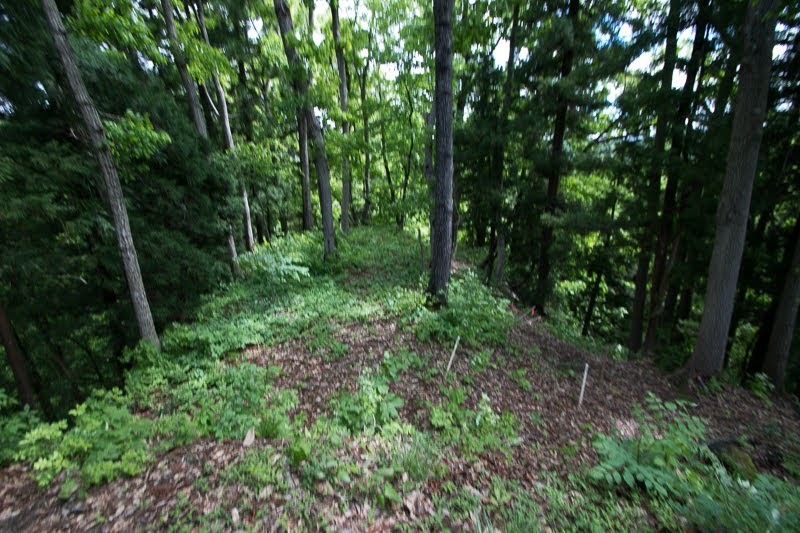 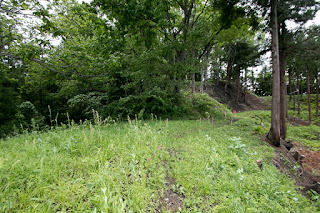 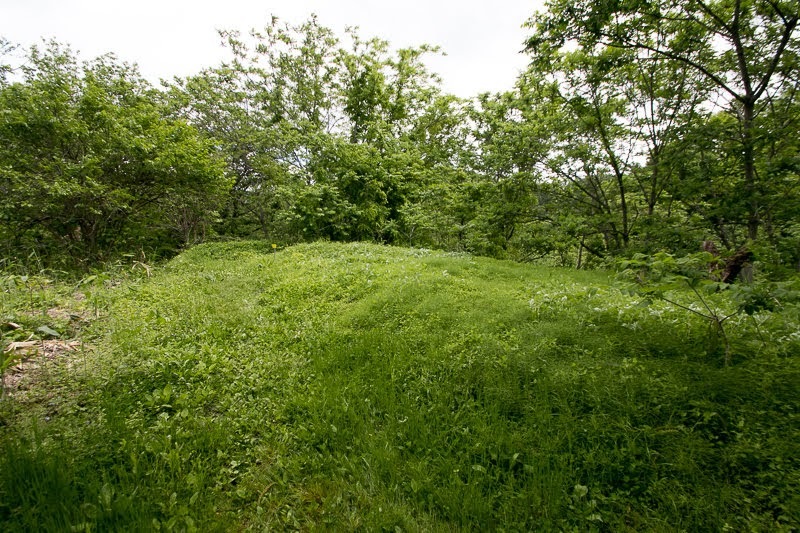 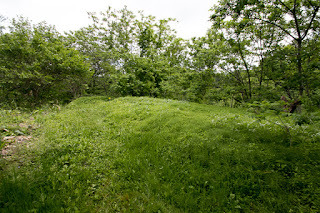 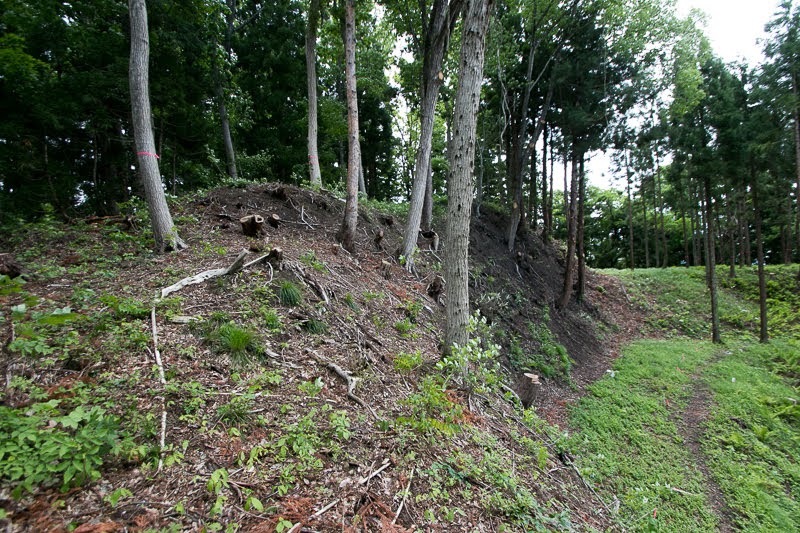 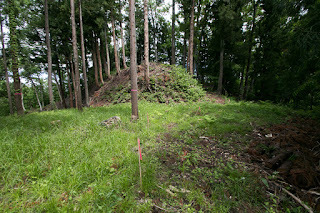 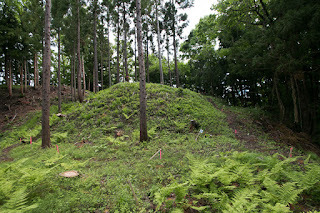 Building many small terraces at the slope is a typical structure of mountain castles under Mogami clan and its relatives, such as Tendo castle or Hasedo castle (Yamagata prefecture). 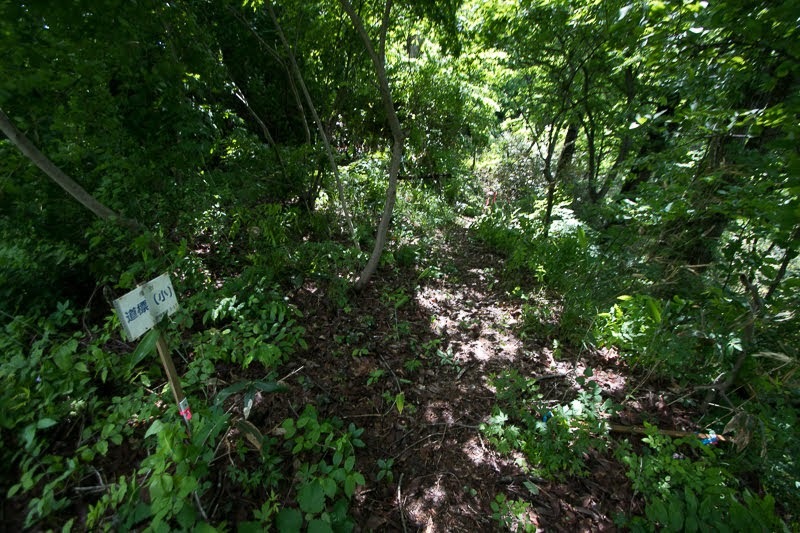 Even though small, masugata style combined gate are built at main approach route. 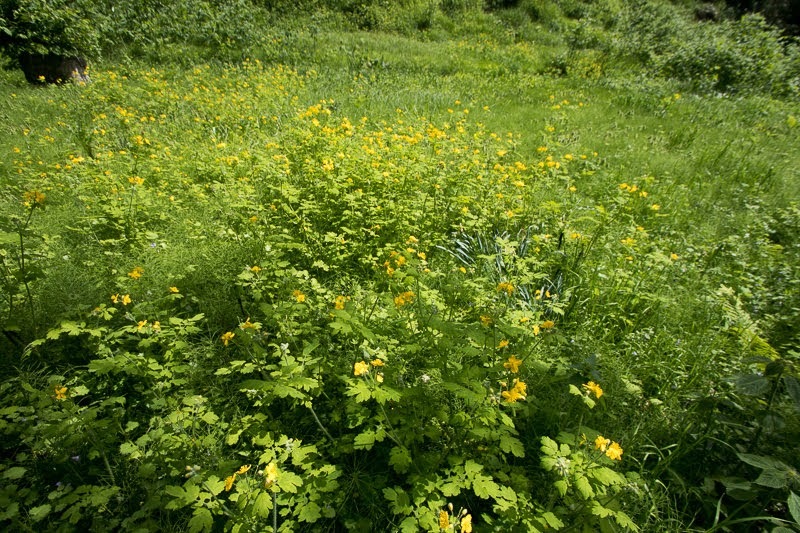 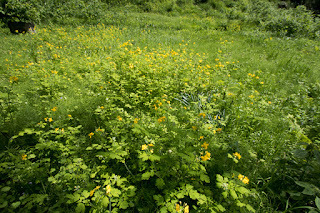 At the east of backside hill, there are large size terraces named Terayashiki where might be a ground of the residence for the lord. 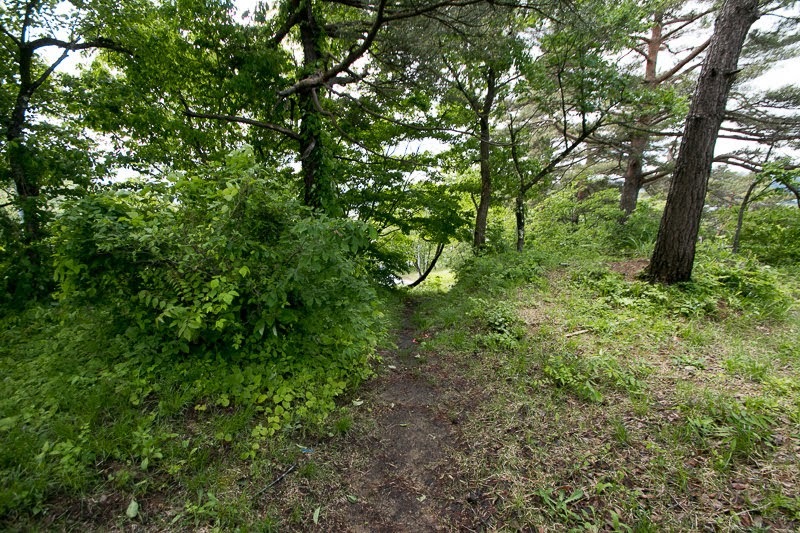 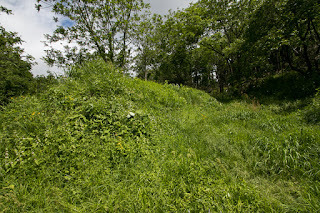 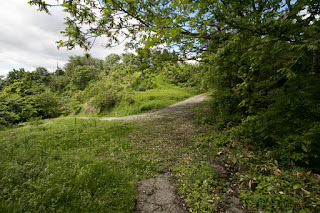 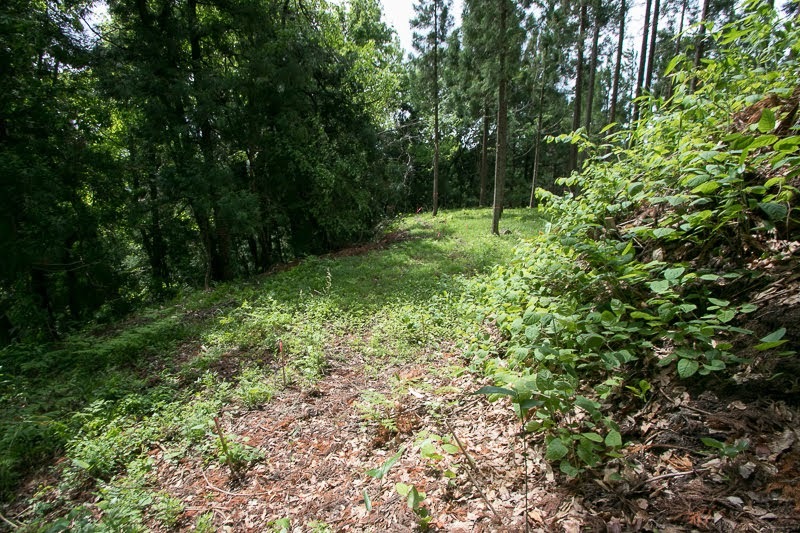 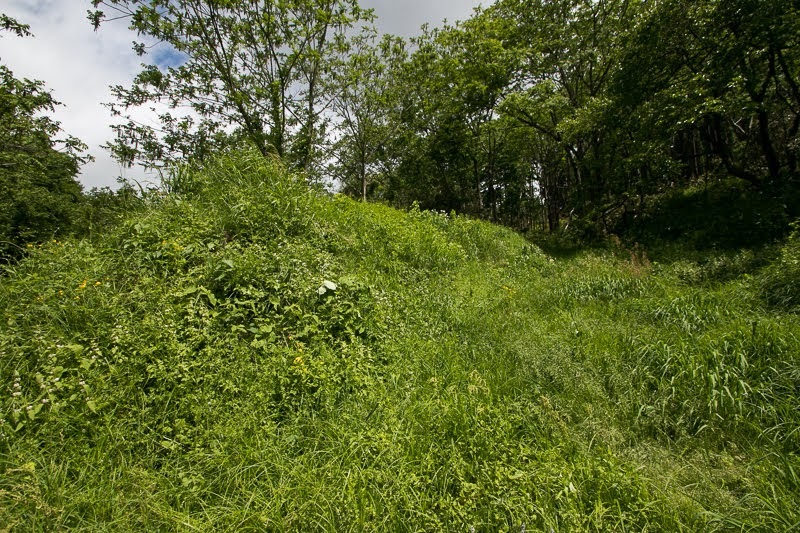 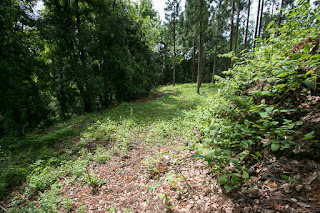 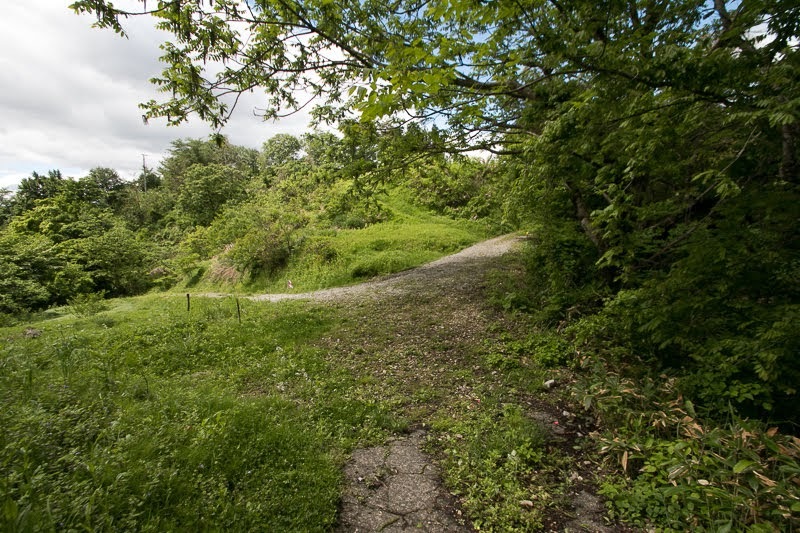 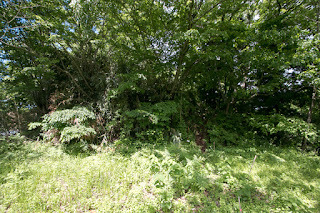 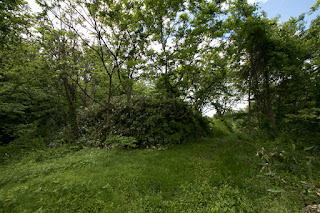 As the westward of the castle which is used as a ground of seminar house is an approach route to the castle, there might be front fort built later. 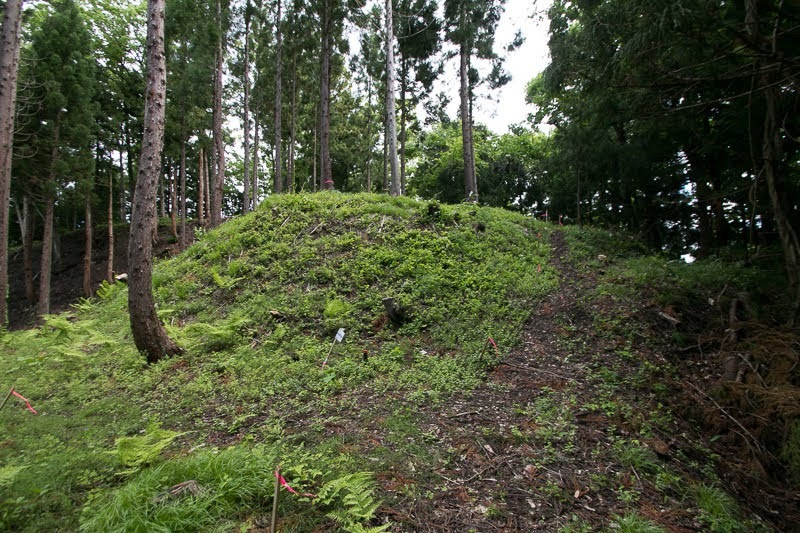 Total size of the castle is 500 meter long and 400 meter wide, and the size and structure of shows the importance of the castle to Mogami clan. 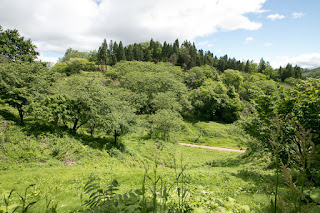 As a result of the battle of Sekigahara occurred in 1600, Yoshiaki Mogami became the lord of whole Dewa province except for Yonezawa basin, and also the owner of whole part of Mogami-gawa river. 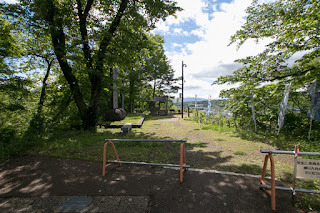 Yoshiaki reformed dangerous point of the river, thus his main base Yamagata castle was directly connected to Sakata port by river transportation. 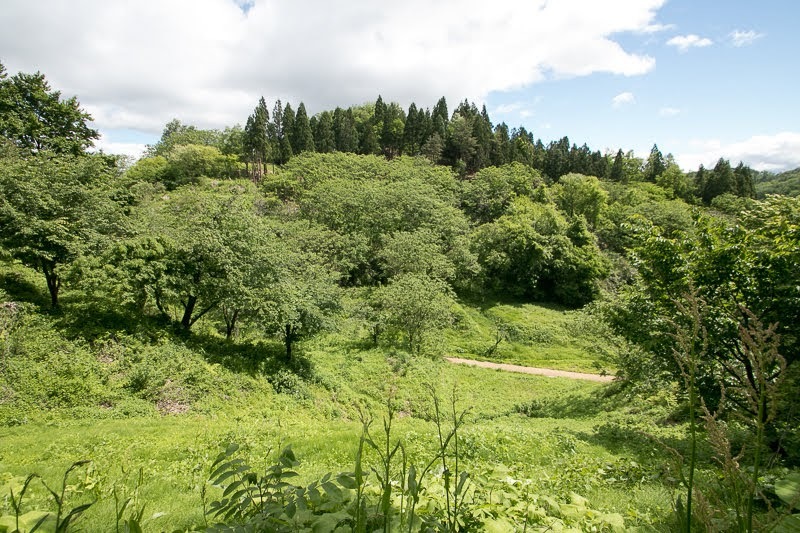 After the move of Mogami clan, Aterazawa area became the branch domain of Sakai clan which was the lord of Tsuruoka castle (Yamagata prefecture). 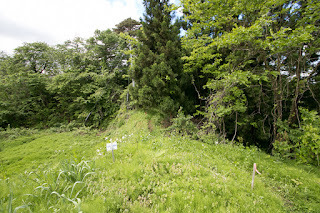 Sakai clan of Aterazawa domain at first used Aterazawa Tateyama castle, but built modern plain castle named Kourushigawa castle at the west of Aterazawa town then Aterazawa Tateyama castle was abolished. 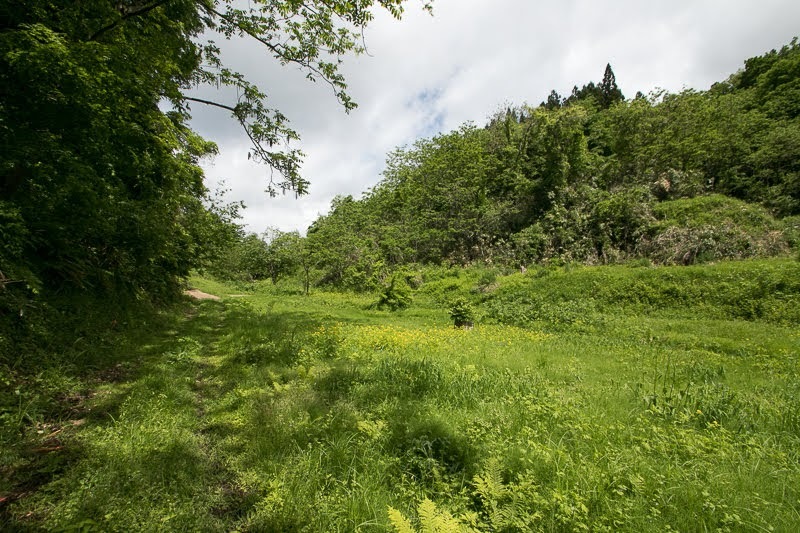 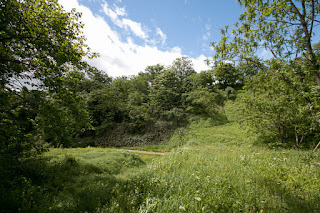 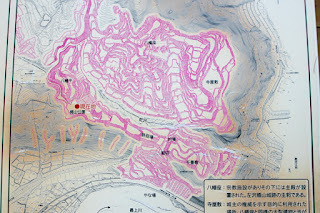 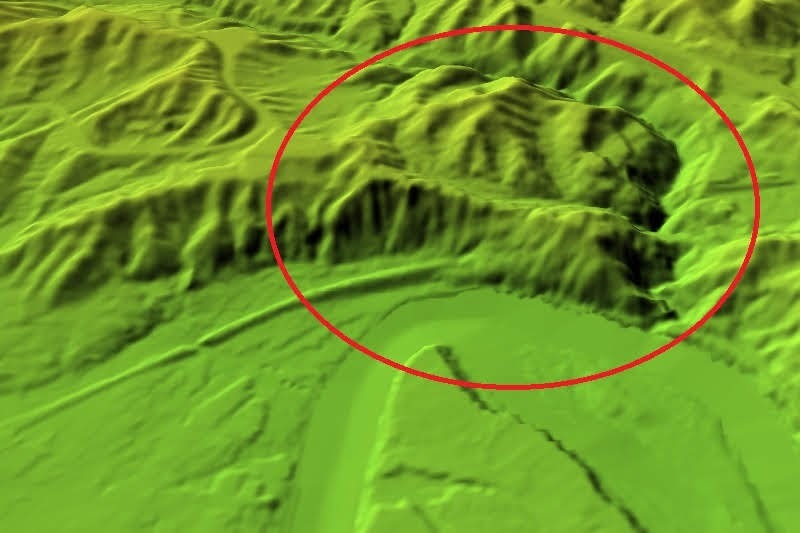 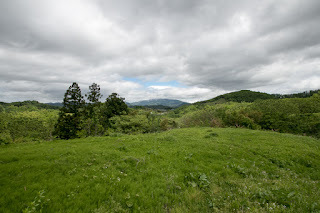 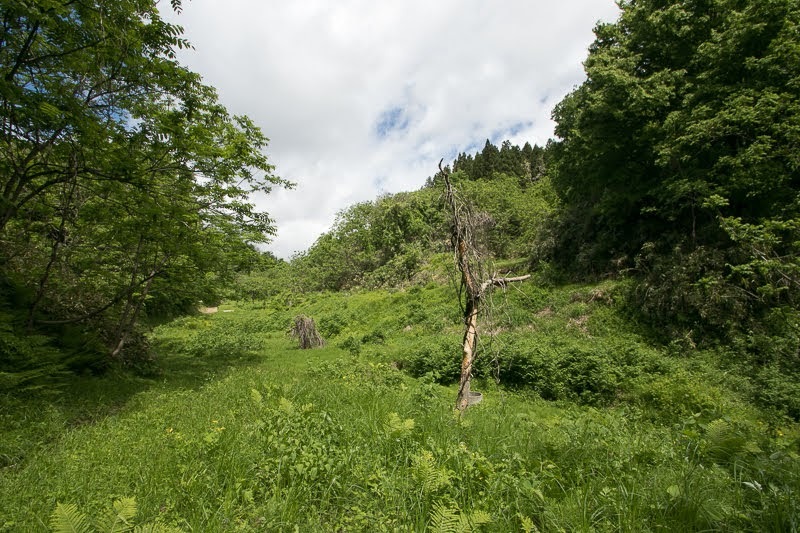 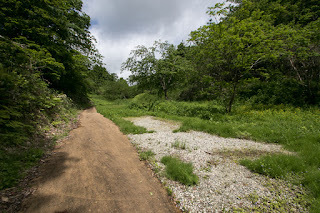 On the end of 16th century, Imogawa valley at the south of Aterazawa town was developed, and Yonezawa area was also connected by river transportation of Mogami-gawa river. 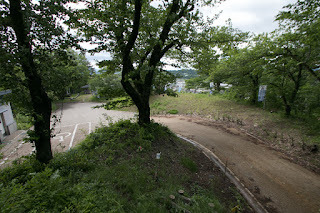 But it was necessary to transfer cargos from larger ships to small ships or reverse side, thus Aterazawa town further prospered at connecting point of the transportation. 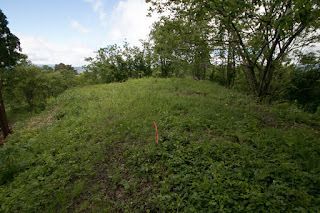 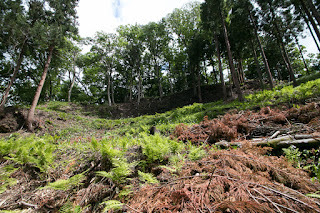 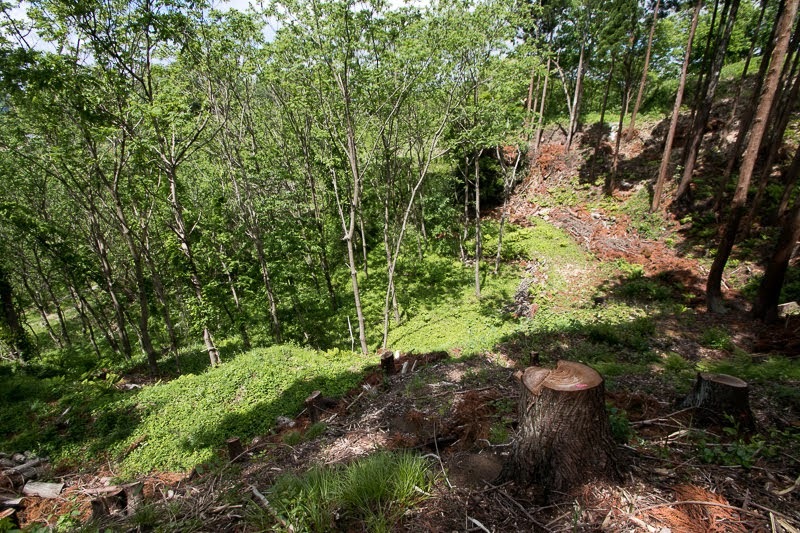 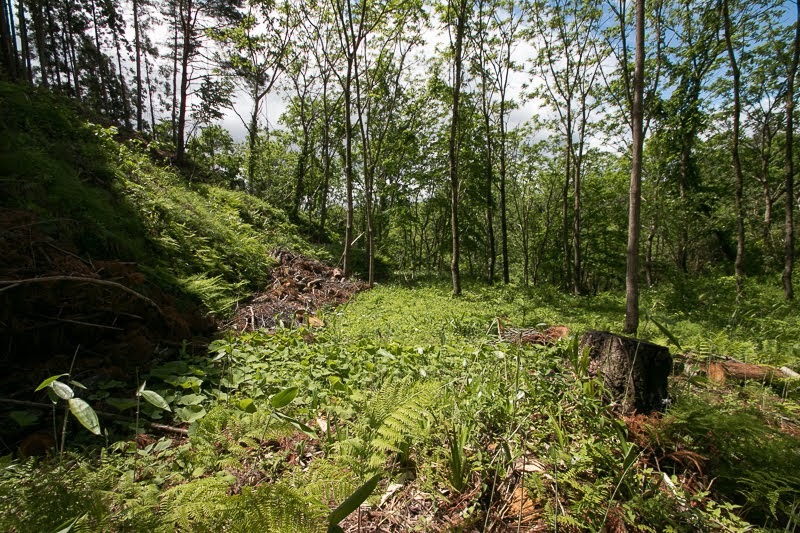 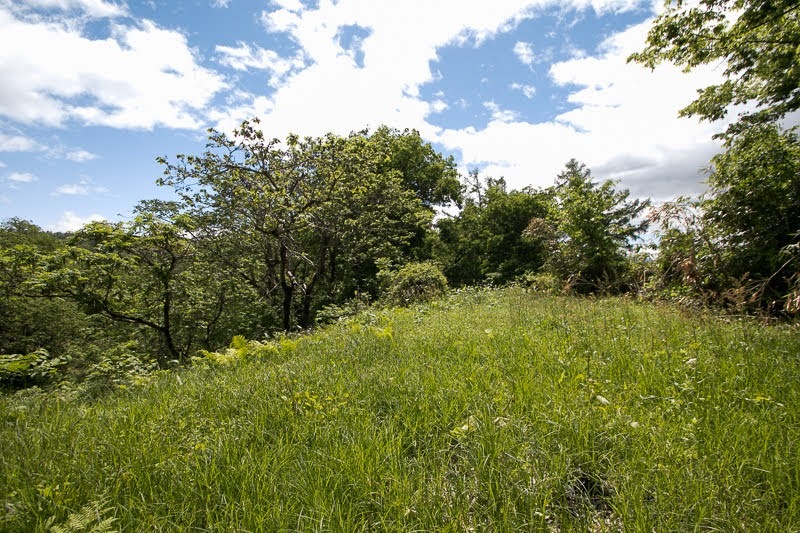 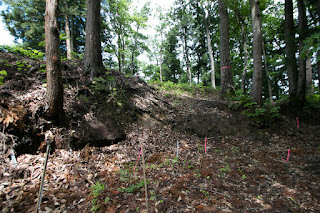 Today all building was lost but structure of the castle roughly remain over the plateau. 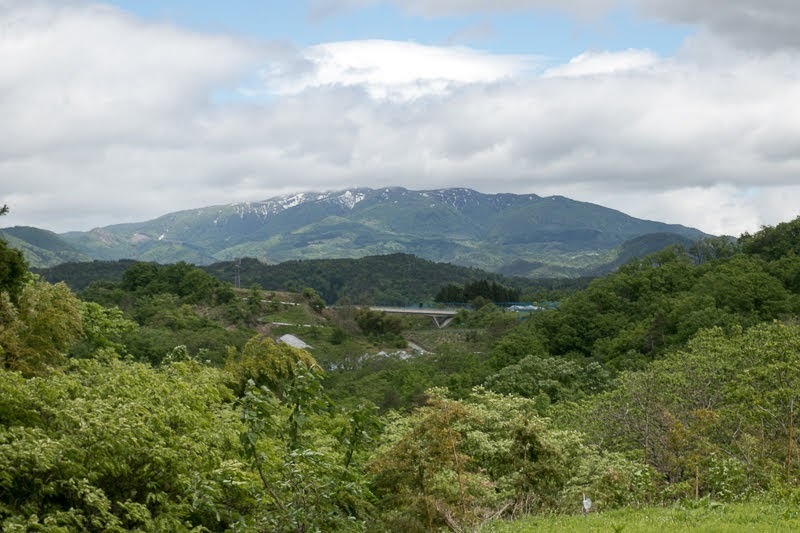 River side hill becomes Tateyama park, and great scenery of curving Mogamigawa river with distant Zao mountain is seen from this point. 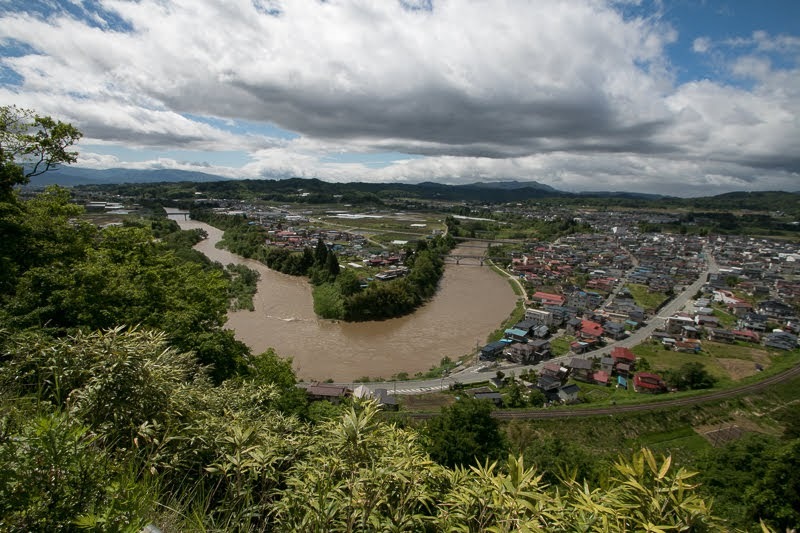 Today nothing floats on the river, but formerly it would more picturesque view come and going ships and lively town like a Ukiyoe-drawing of river area of Edo city. 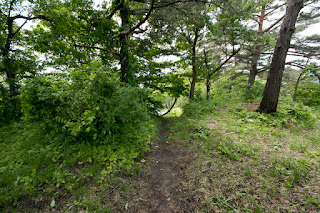 20 minutes walk from JR East Aterazawa-sen line Aterazawa station. 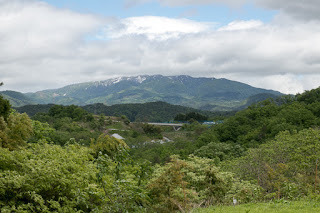 20 minutes drive from Yamagata Jidoshado Expressway Sagae interchange.